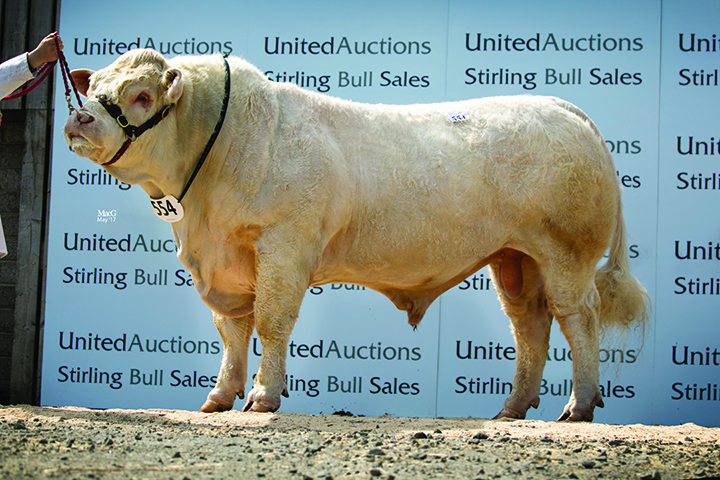 Charolais sold the most bulls, had the highest average and best clearance rate of the spring round of the Stirling bull sales. There were 121 bulls sold representing an 83.5% clearance, with bull sales topping at 13,000gns and averaging £6,063. 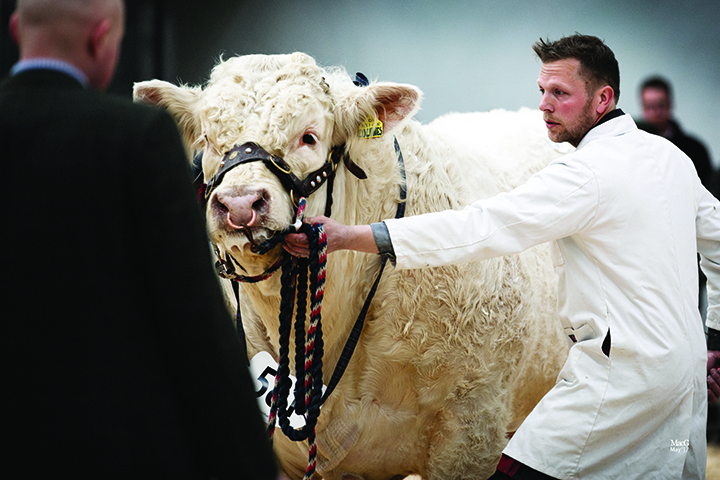 The heifer prices peaked at 5,800gns, while the dispersal of the Alsnow herd saw prices of up to 8,500gns for cows and calves. Chief Executive of the Charolais Society peter Phythain commented that he was “Absolutely delighted with the sale, despite all of the doom and gloom in the industry at the moment and the uncertainty over Brexit, Charolais once again proved to be the sire in most demand”. The top priced bull was the class winning Thrunton Nugget, a May 2017 born son of the homebred pairing Thrunton Gladiator and Thrunton Hoopla, who goes back to Thrunton Doubletop. 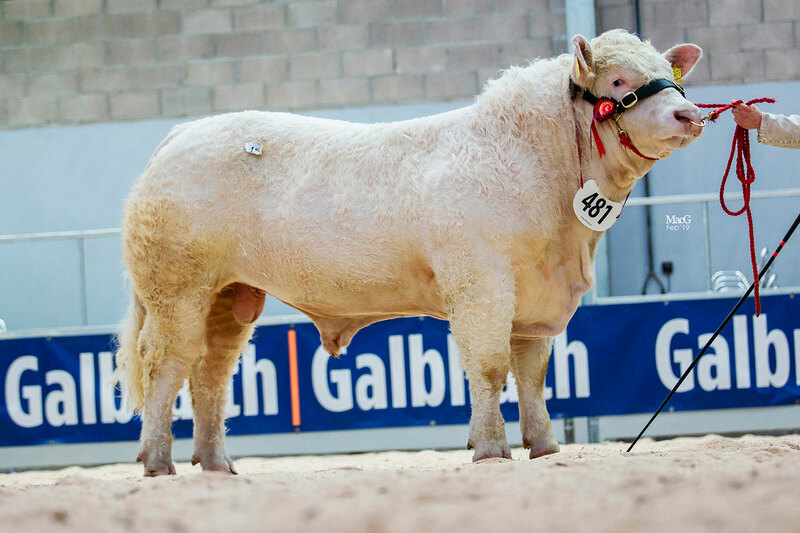 He was offered for sale by JHC Campbell & Sons and purchased by Kevin Thomas, Newcastle Emlyn, Carmarthenshire for 13,000gns. 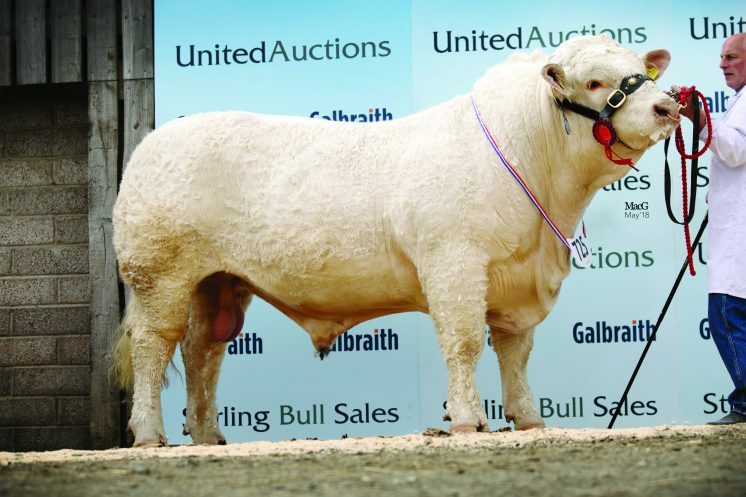 The Campbell family went on sell a total of four bulls to average £9896.25 and their next highest priced at 10,000gns was the 16 month old Thrunton Nike, who is also sired by Thrunton Gladiator but this time out of the 22,000gns Newhouse Bigal daughter Thrunton Exquisite and purchased by AJ Maclean, Scarinish, Isle of Tiree. 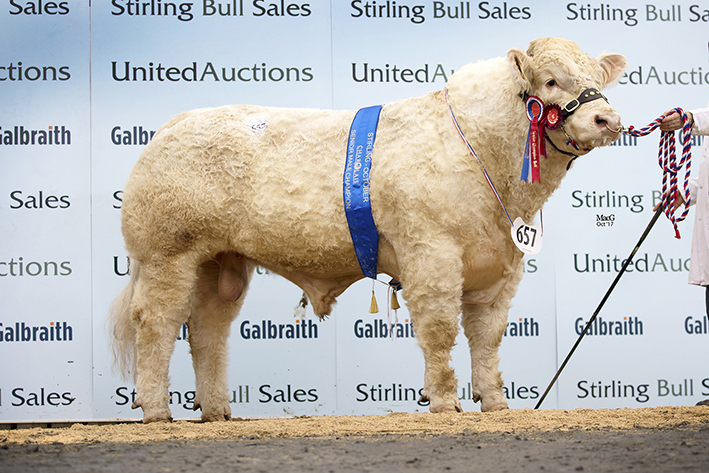 The Campbell’s other top seller Thrunton Nighthawk was snapped up by JW Hogg, Grifford, East Lothian, for 8,500gns. 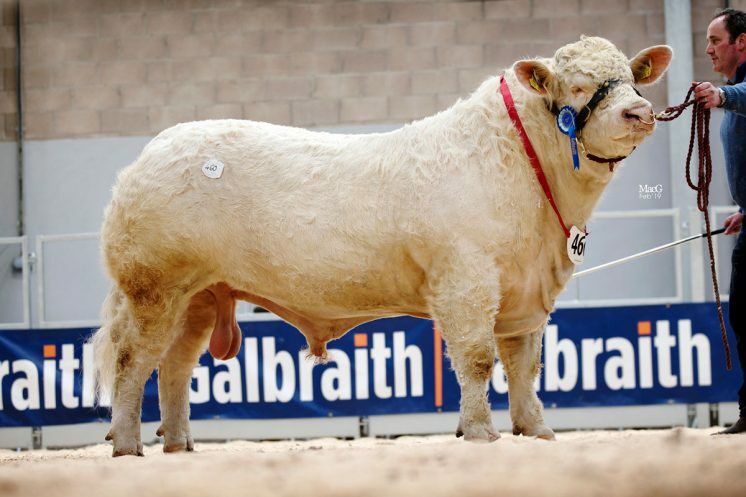 Nighthawk is a September 2017 born son of the 28,000gns Maerdy Jerusalem and Thrunton Gitane, a 20,000gns Perth supreme champion Moncur General daughter. 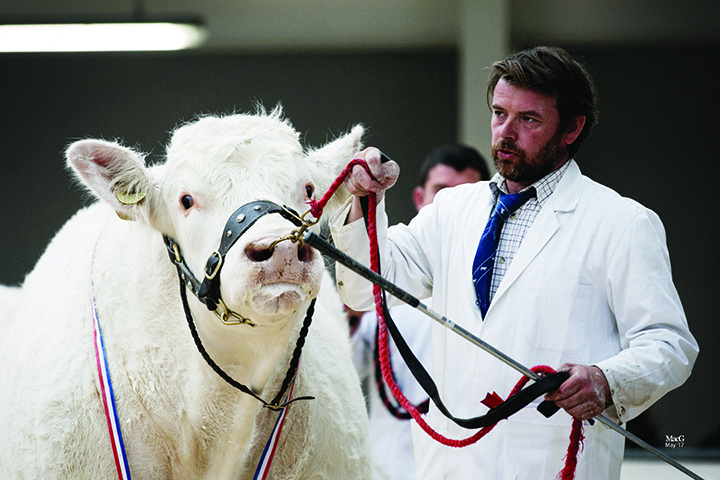 The presale senior champion was next in the trade stakes at 12,000gns. Inverlochy Nelson, a 21 month old, who was bred and exhibited by father and son team John and Raymond Irvine, Tomintoul, Banffshire, is sired by the Highland show supreme champion and Irish-born Kilbline 1 Instigator and out of Inverlochy Gypsum, a daughter of the Black Isle Show champion Lochend Apache. He goes on to work in Crawford, Lanarkshire, for Mr and Mrs JJ Wight. 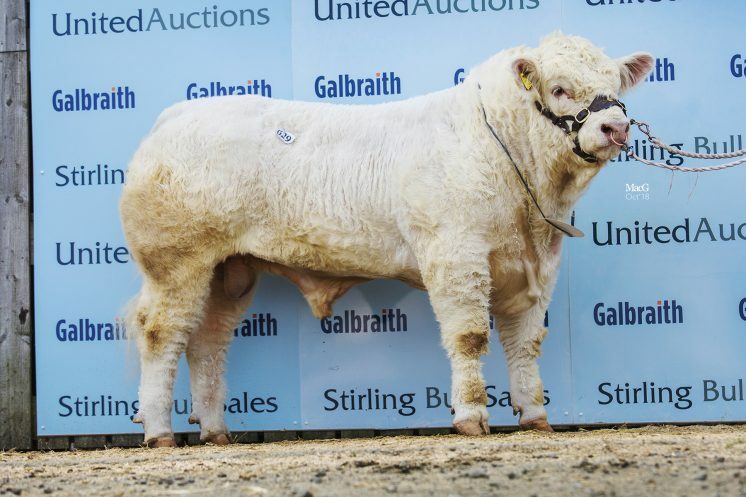 A trio of lots went under the hammer for the 11,000gns and the first was an entry from Alasdair Houston, Gretna Green, Dumfries-shire who caught the eye of T Smith and Son, Alford, Aberdeenshire, when he was tapped out first in his class at Monday’s pre-sale show. 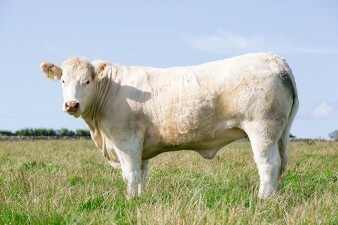 Gretnahouse Neverland, a June 2017 born son of Westcarse Jimmy, who has sired over 40 progeny in the herd since his purchase in 2016, is out of the Gretnahouse Ultimate daughter, Gretnahouse Daisy. 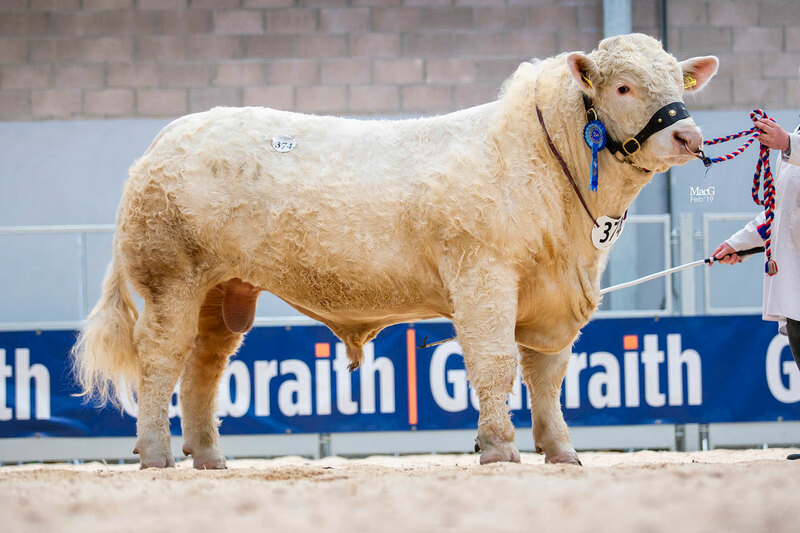 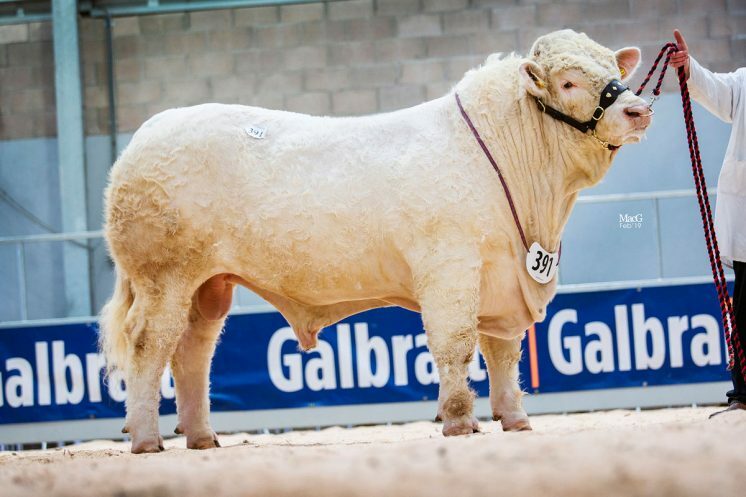 Mr Houston went on to sell another three bulls and averaged £8269 for the lot, with his next highest priced, the yellow ticket winner and June 2017 born Gretnahouse Nylon, also sired by Westcarse Jimmy and selling to H MacDonald, Advie, Morayshire for 8,500gns. 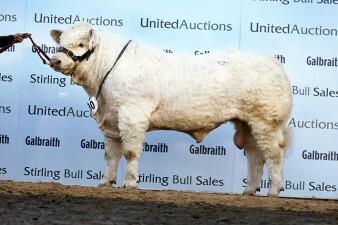 He is bred out of Stobarts Fabulous, a 13,000gns Woodpark Bishop daughter. 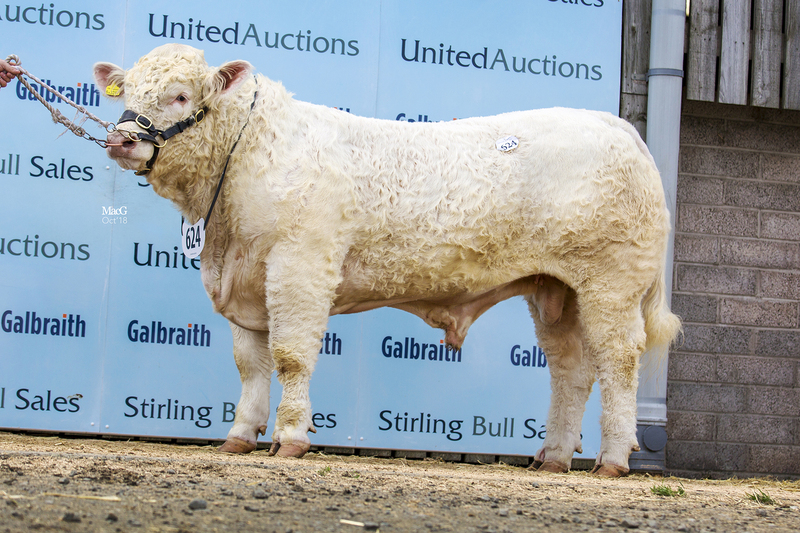 Matching the 11,000gns price tag and this time selling to JG Wilson, Glenkindie, Aberdeenshire, was the 18 month old Harestone Nighthawk who had also secured a red ticket at the previous day’s show. His dam is Harestone Brigette who goes back to the Royal Highland show supreme champion Harestone Ronsard, he is sired by the 12,000gns Balmyle Addition and was bred and exhibited by R and N Barclay, Insch, Aberdeenshire. 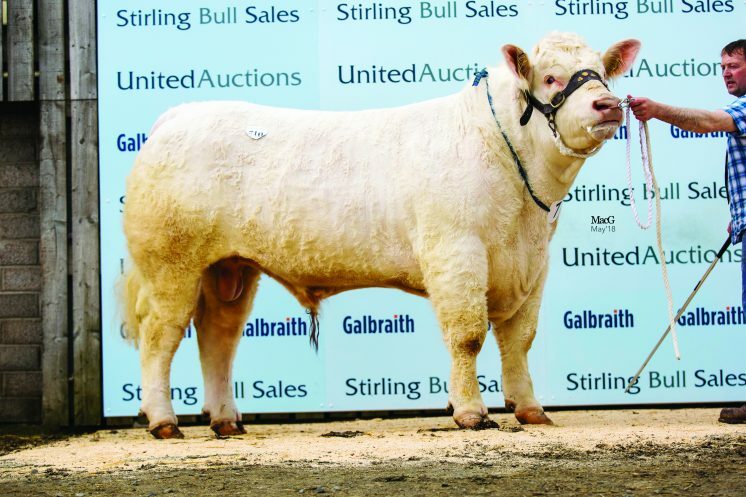 Goldies Navigation was another pre-sale show class winner purchased for 11,000gns, this time offered for sale by Hamish Goldie, Ruthwell, Dumfries-shire. An 18 month old son of the 15,000gns herd sire Gretnahouse Heman, who has bred over 120 progeny into the herd, Navigation is out of Goldies Hazel, a 12,000gns Goldies Elation daughter. 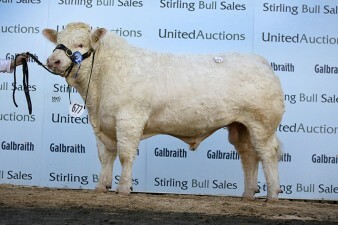 GA Mackie, Rescobie, Angus, was the purchaser. Up next and knocked down at 10,500gns was the blue ticket winner and September 2017 born Killadeas Noah from Stuart and David Bothwell, Ballina Mallard, co Fermanagh. Purchased by J Warnock, Broughton, Lanarkshire, he is sired by Blelack Blackberet and his dam is Killadeas Hazeline, a daughter of the 16,000gns Stirling supreme champion Blackford Dynamite. 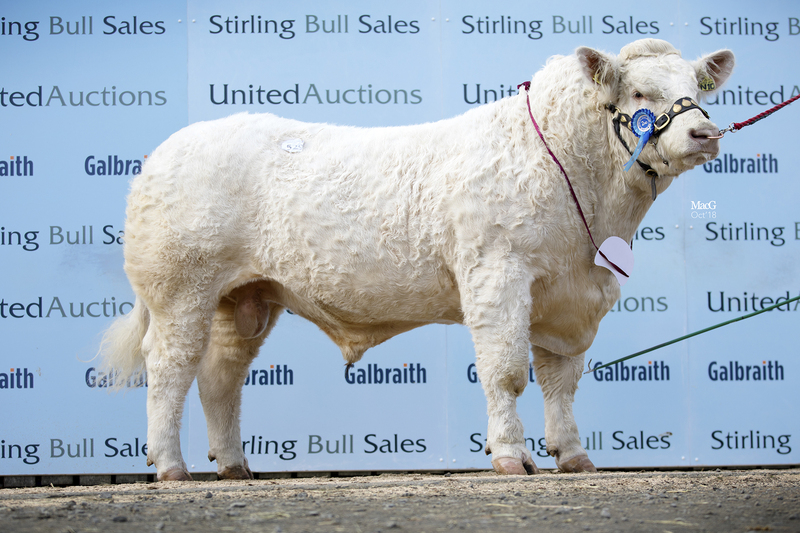 The aforementioned Hamish Goldie, who sold a total of 13 to average £7083, was the first to sell one of five 9,500gns priced lots, also sired by Gretnahouse Heman. 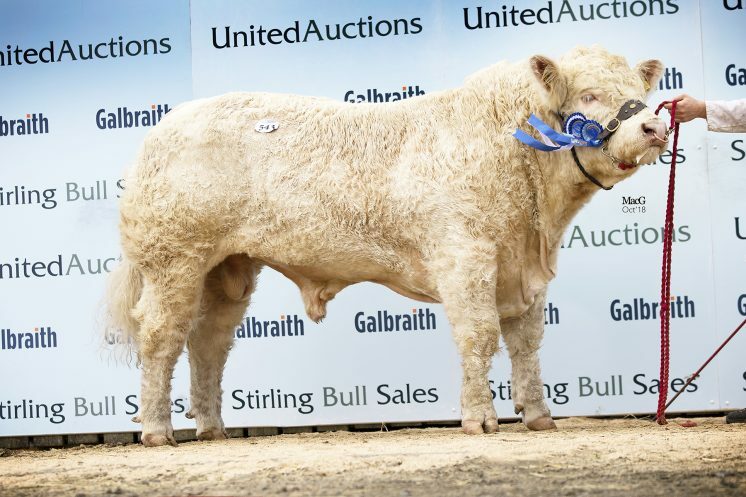 This one was knocked down sold to A and J Wilson, Culsalmond, Aberdeenshire who bid off the competition to secure the class winning Goldies Nugget, a 20 month old out of Blelack Blackberet daughter Goldies Gilly. Mr Goldie went on to sell another 9,500gns lot, the 15 month old Goldies Noelle. 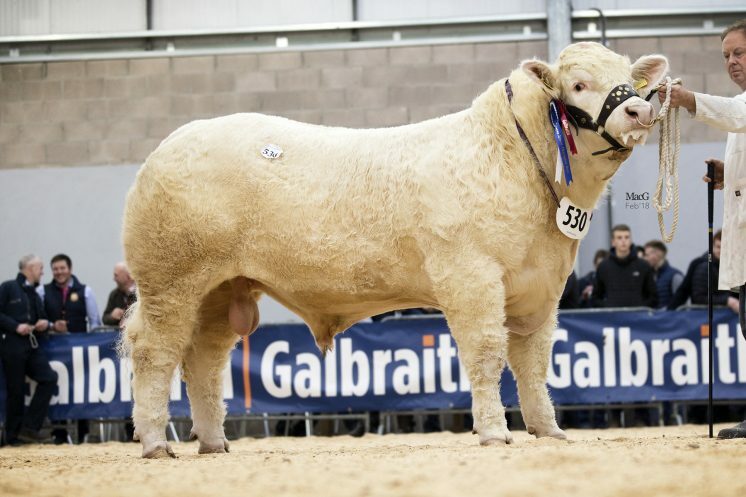 This time sired by the homebred Goldies Formidable and out of another Blackberet daughter – Goldies Eclair, he was purchased by Adrian Ivory, Meigle, Perthshire. 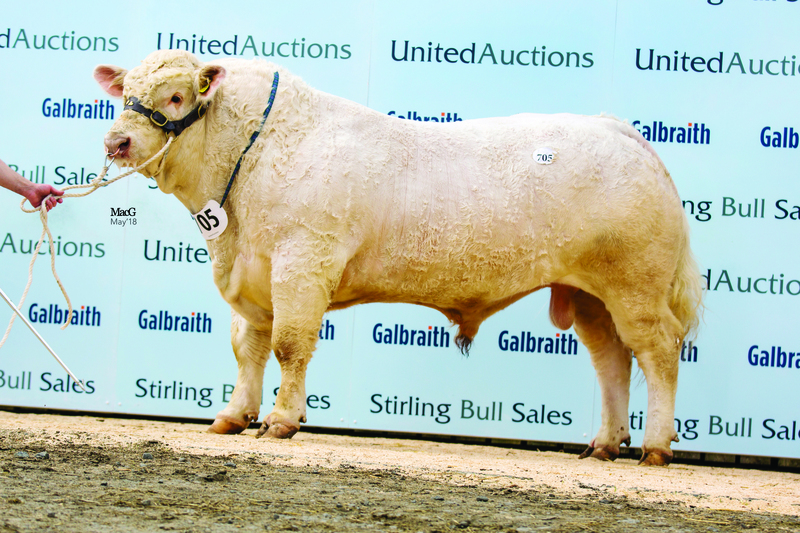 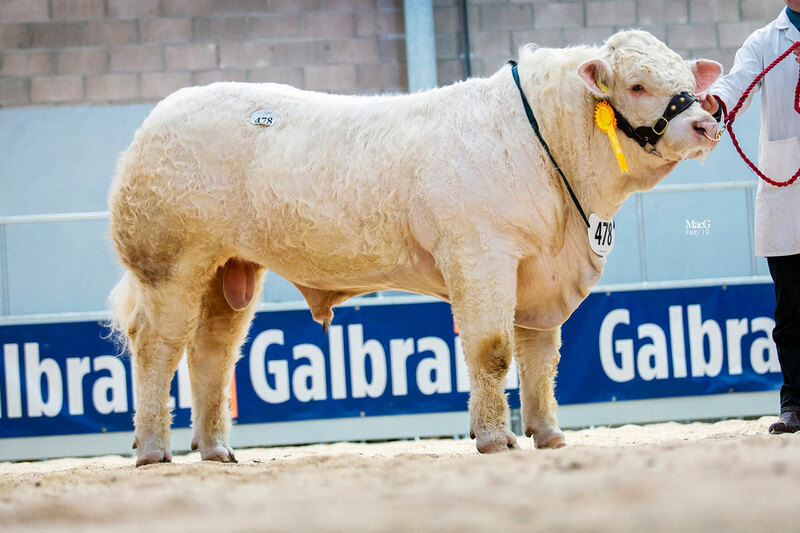 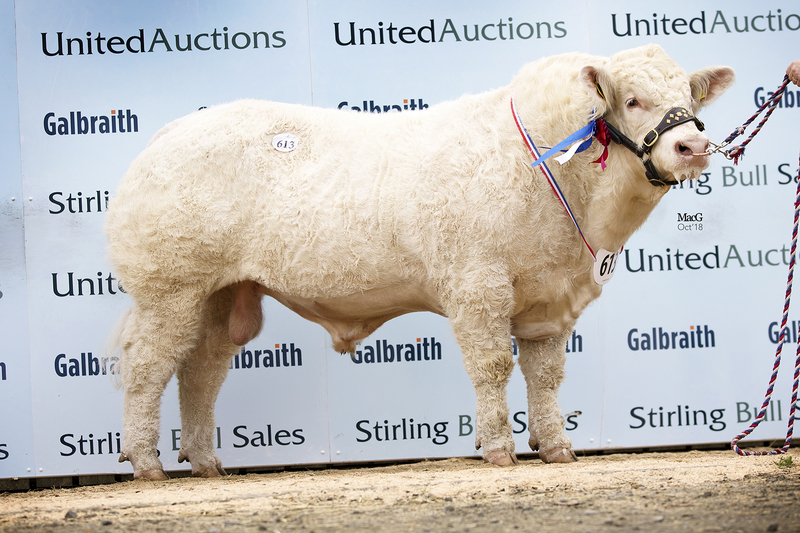 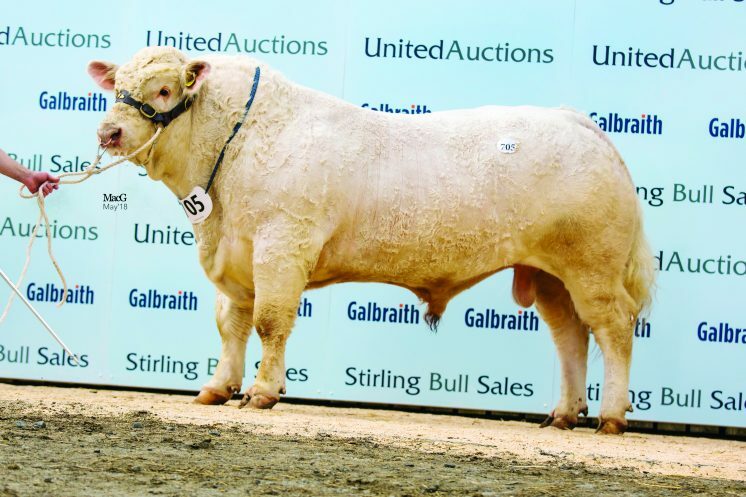 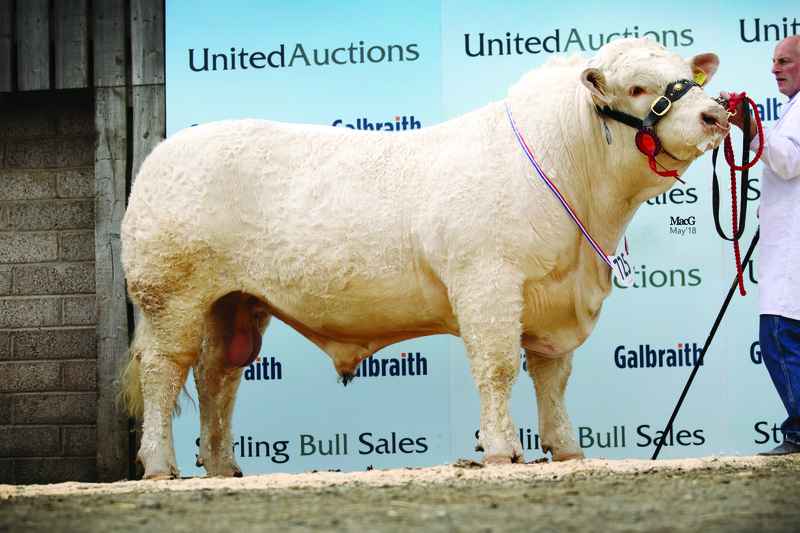 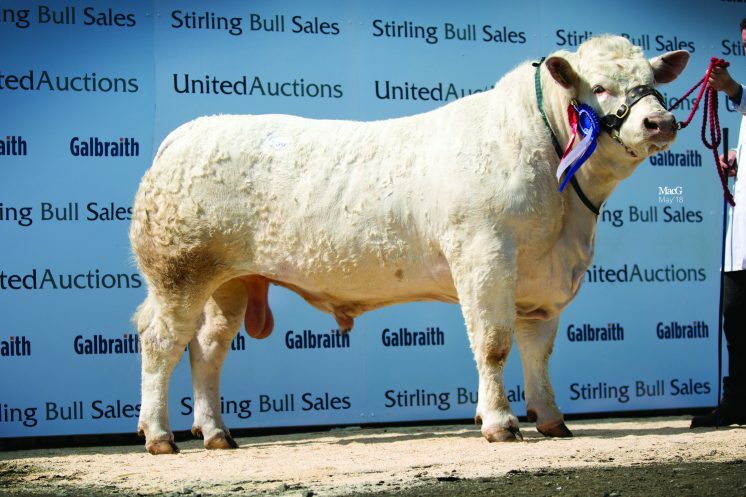 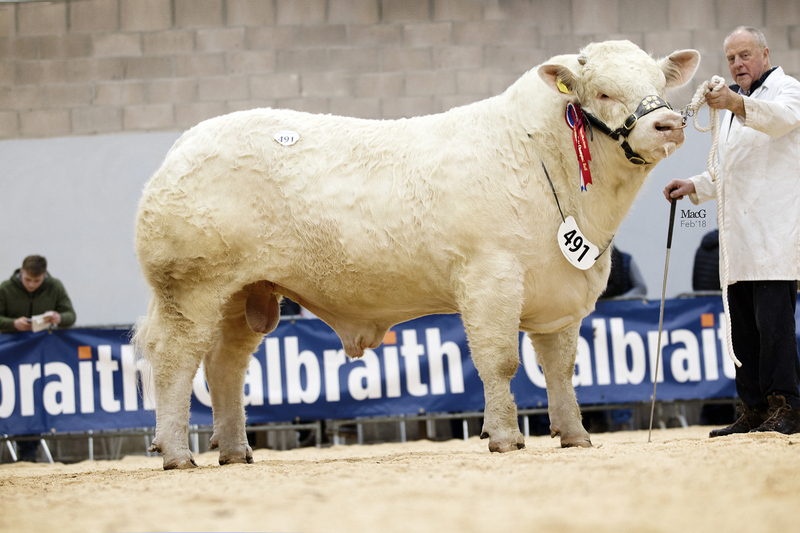 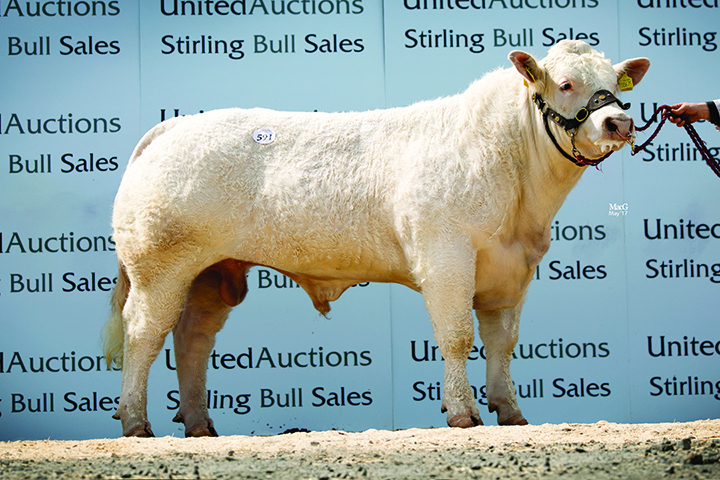 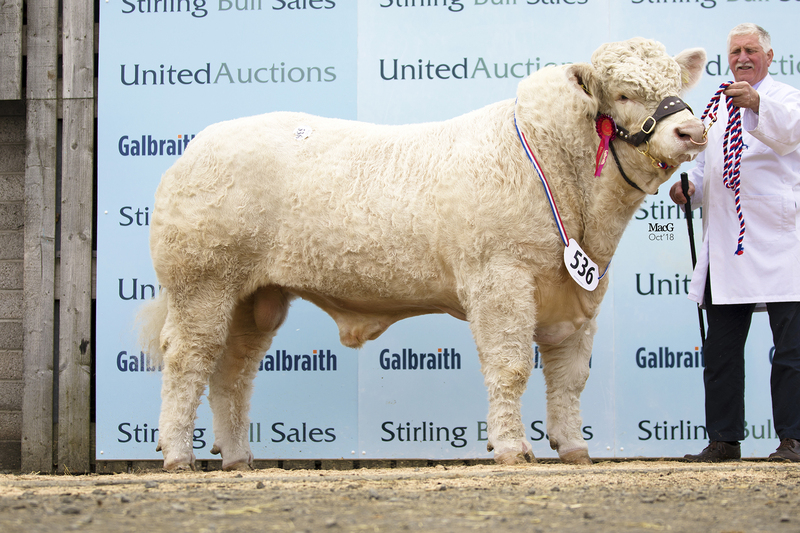 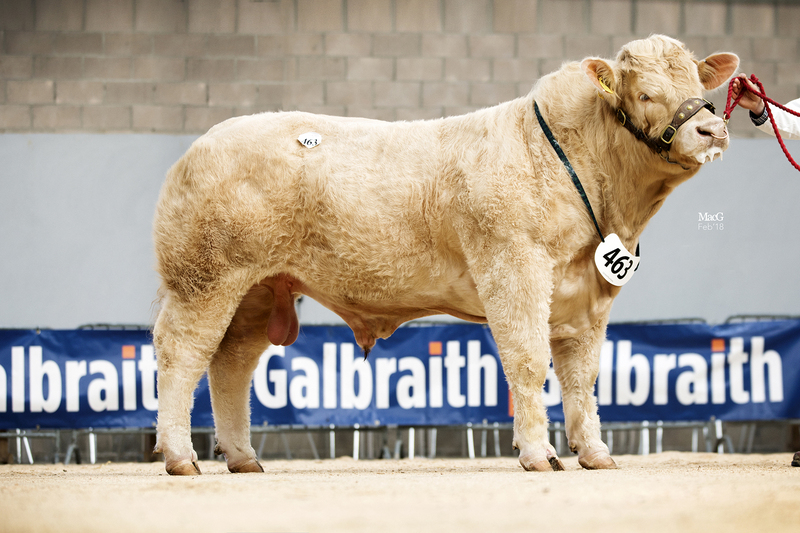 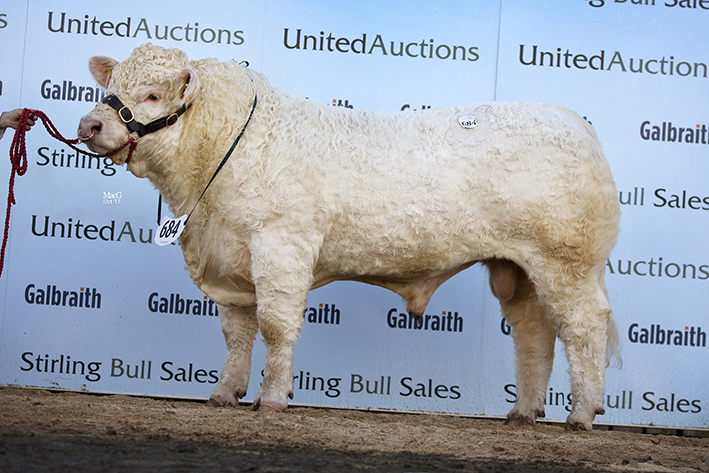 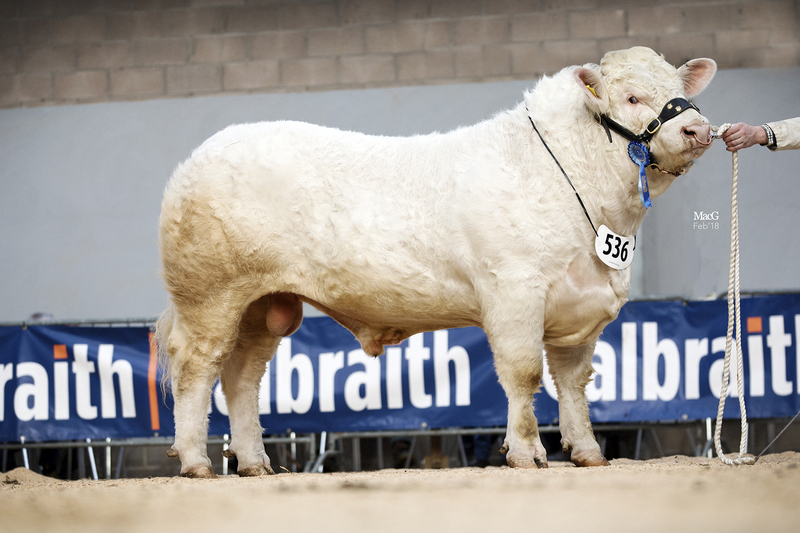 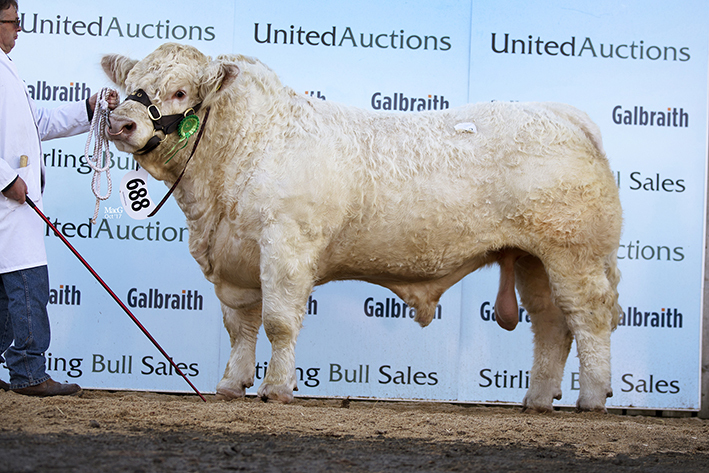 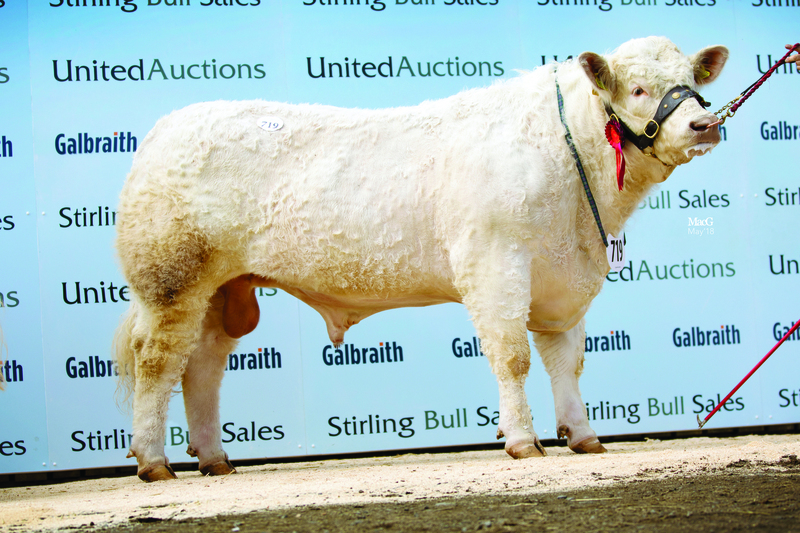 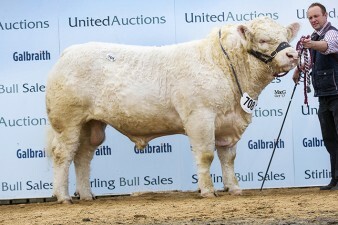 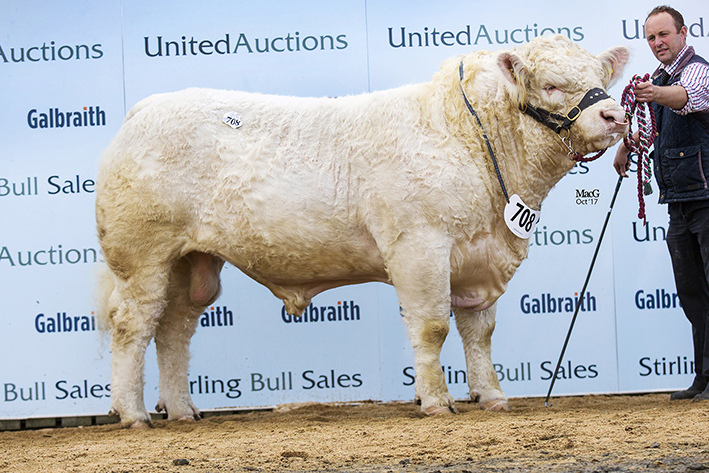 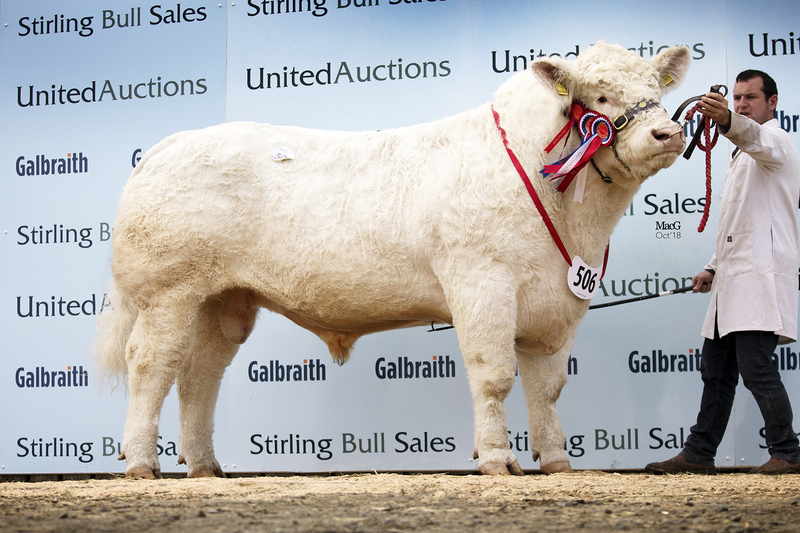 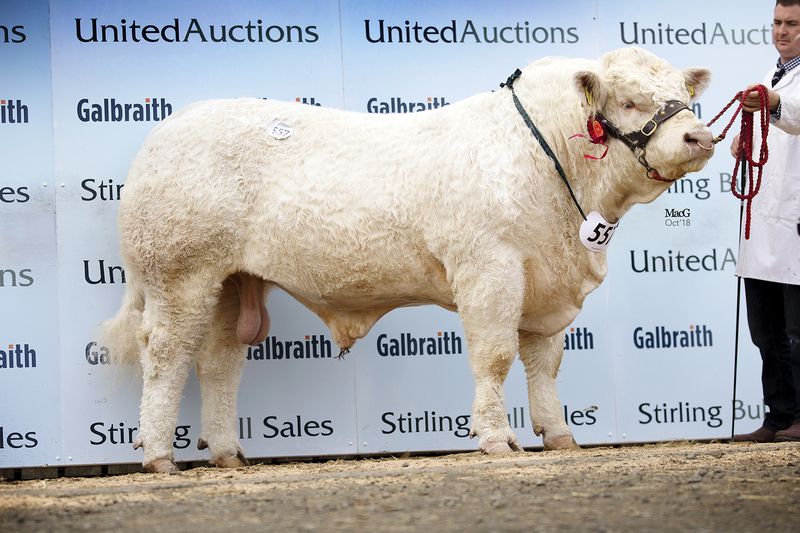 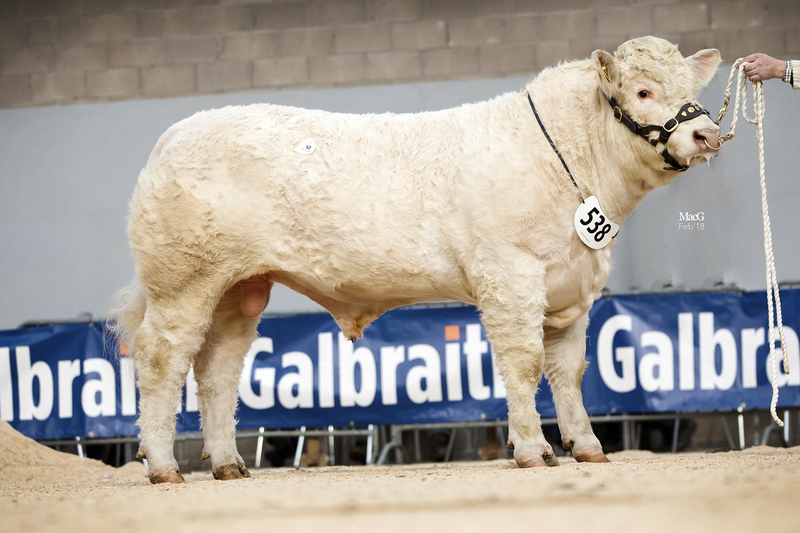 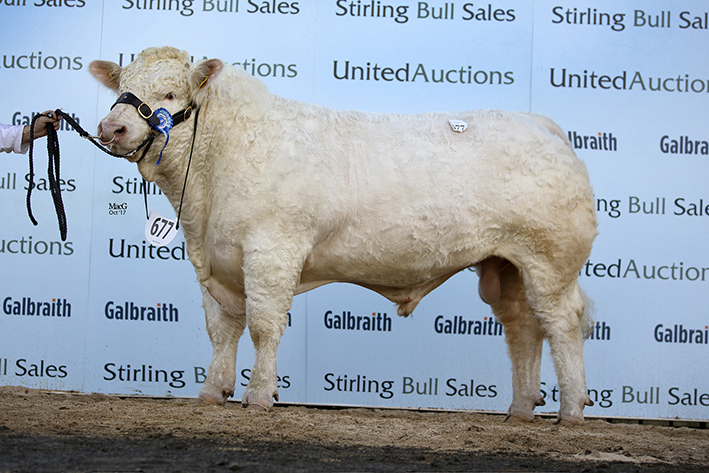 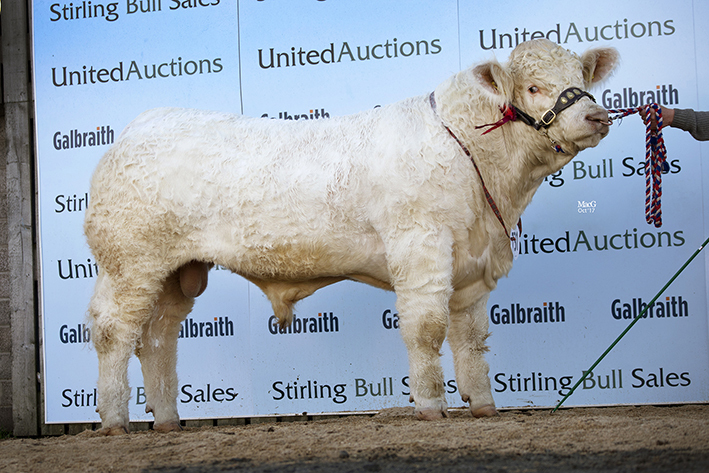 The next 9,500gns lot was one of 17 bulls presented by Major Walter, Balthayock, Perthshire, which averaged £6850. 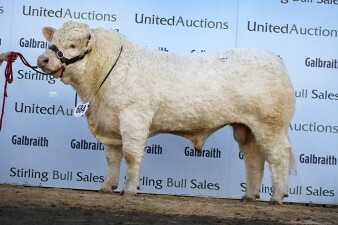 Balthayock Nominee who was purchased by CD Timm, Appleton Roebuck, Yorkshire. Sired by the homebred and 64 time father Balthayock Impression, the June 2017 born Nominee is out of Balthayock Japonica who goes back to Barbican Lancer. 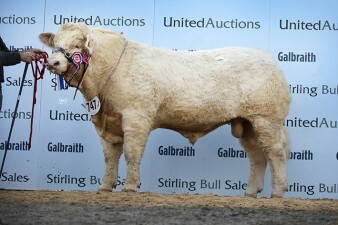 The reserve supreme and intermediate champion was also offered for sale by the Major. 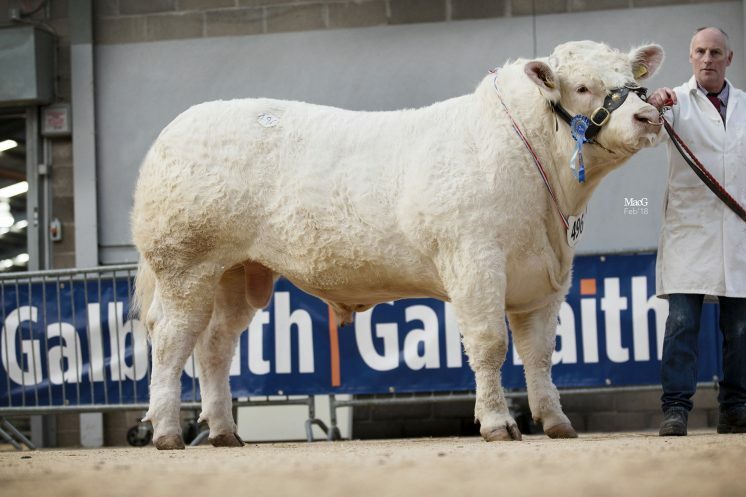 Balthayock Nanook, a 19 month old son of Highland show champion Balthayock Imp who has previously sold sons to 19,000gns and Barbican Lancer daughter Balthayock Gemma, goes on to work in Dundee for WJ Millar of Tealing, who purchased him for 9,500gns. The Major’s other two top priced lots both commanded bids of 8,500gns, the first being a May 2017 born blue ticket winner who was purchased by CA Smith, Tarland, Aberdeenshire. Balthayock Newton is again sired by Balthayock Imp but this time out of Balthayock Heloise who goes back to Swalesmoor Cracker. The second was the June 2017 born Balthayock Nuffield, out of another Cracker daughter – Balthayock Heroine, he is sired by the Royal Welsh show and 20,000gns Maerdy Grenadier and sold to Shanry Farms, Rait, Perthshire. 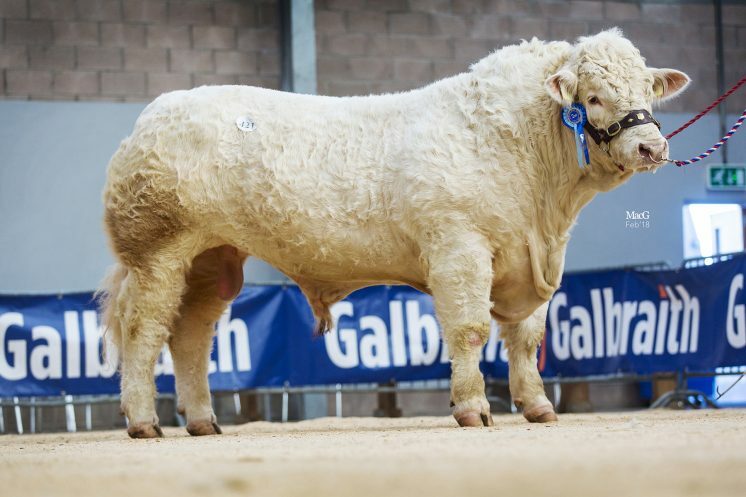 The last 9,500gns bull was Woodpark Neptune, an 18 month old by the Irish-bred Deeside Guillver who has gone on to add 94 progeny to the British herd book. 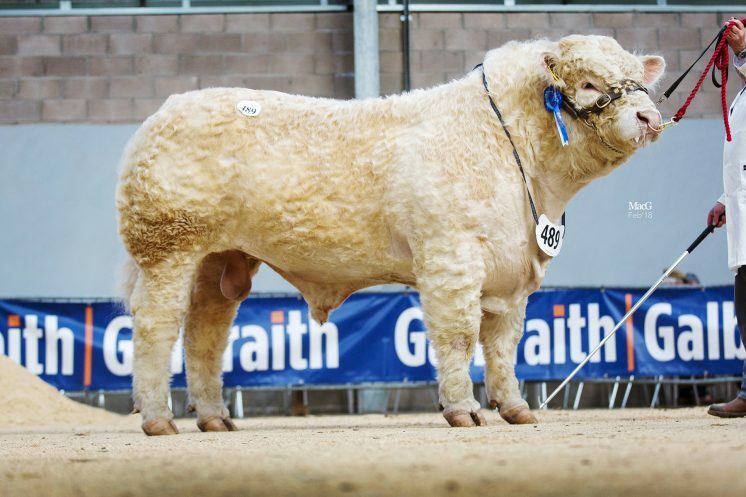 His dam Woodpark Izzy is in turn sired by the 19,000gns Perth reserve junior champion Corrie Alan and he came all the way from Beragh, Co Tyrone with breeder and exhibitor Will Short to go home with D Munro, Kingussie, Inverness-shire. 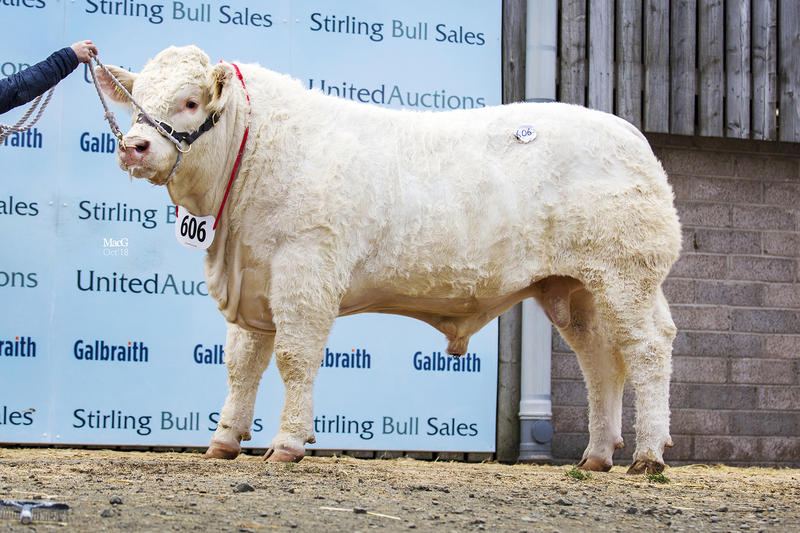 Main sale females topped at 5,800gns for the twelve month old Formakin Opal from the McMurrich Partnership, Causewayhead, Stirlingshire. 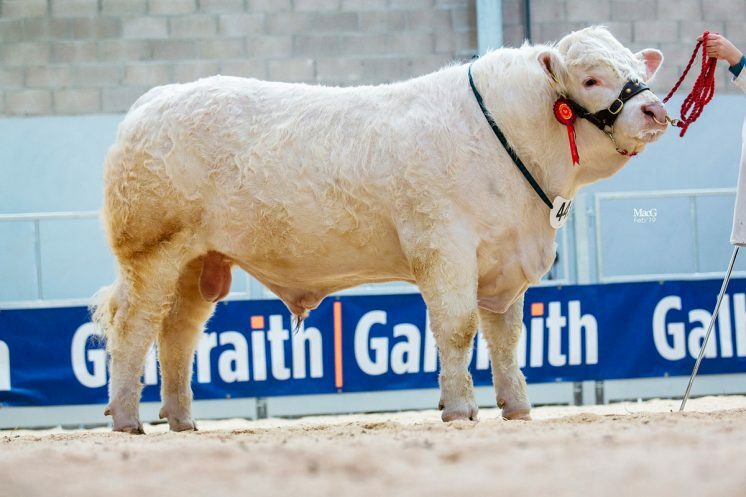 Sired by the French-bred Hercule and out of the Balthayock Matthew daughter and Stars of the Future class winner Formakin Licorice, she was purchased by the Rettie partnership. 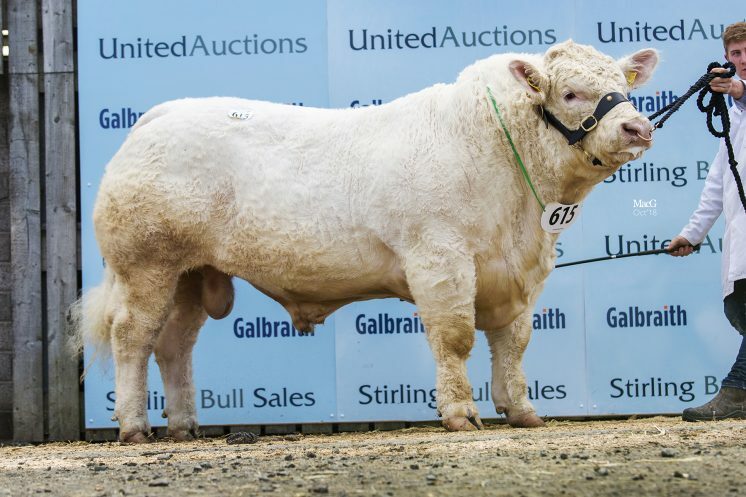 Hamish Goldie also had heifers for sale, the highest priced of which made 4,500gns when she was purchased by DP Daniel, Maxworthy, Cornwall, who also went on to buy another of Mr Goldies lots for 3,800gns. 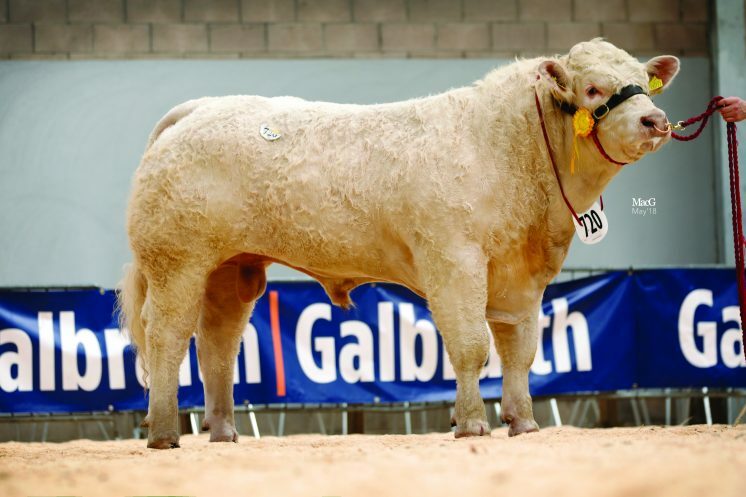 The 23 month old Goldies Nell was the first, a Blelack Blackberet daughter out of Goldies Lynn, who in turn is sired by the 15,000gns Gretnahouse Heman. 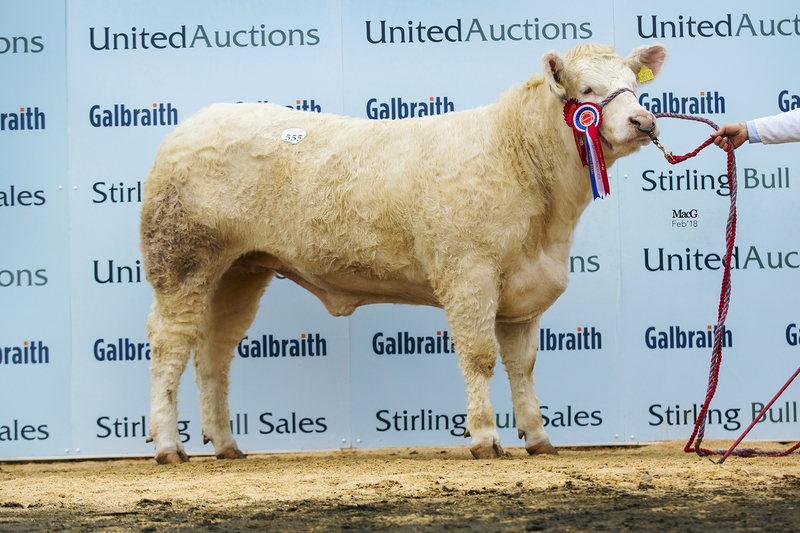 Which was followed by the female champion Goldies Nina who is a March 2017 born daughter of the 14,000gns Goldies Joss and Goldies Jollygood. The sale featured the dispersal of the Alsnow herd of Alan R Lawson & Son whose females sold to a top price of 8,500gns for Alsnow Enchantress and her female calf at foot Alsnow Olwen. Enchantress has produced two RHS class winning daughters and is sired by Blelack Roger, while her dam is Alsnow Victoria who goes back to the 25,000gns Perth supreme champion Thrunton Socrates. 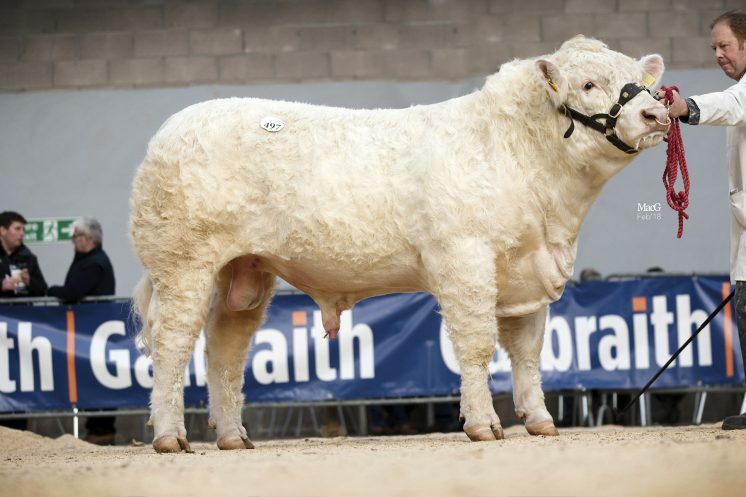 Her daughter five month old Olwen is sired by Blelack Immaculate and the set were purchased by the above mentioned N and R Barclay, who went on to purchase another of the Lawson family’s lots. Their next highest priced lot sold in a two-way split at a total of 6,800gns, with the 2014 born cow Alsnow Jazzygirl heading on to Hexham, Northumberland with G Grieve, while her April 2018 born bull calf Alsnow Oscar was sold to FR Walton, Morpeth, Northumberland. 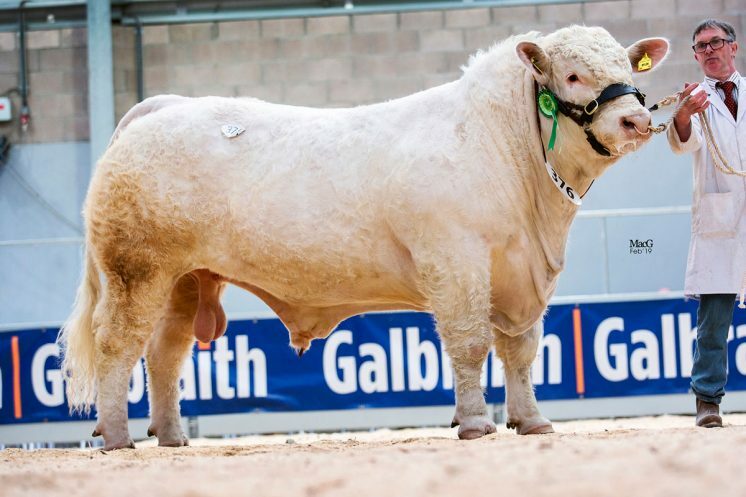 The triple calving Jazzygirl is a daughter of the 10,000gns Puntabrava Federico and out of a Blelack Roger daughter Alsnow Dixie and Oscar is sired by Alsnow Hurricane. 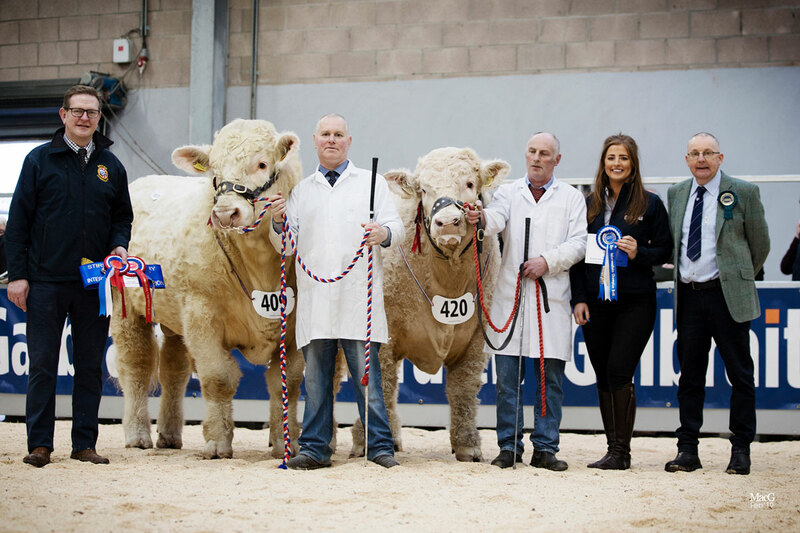 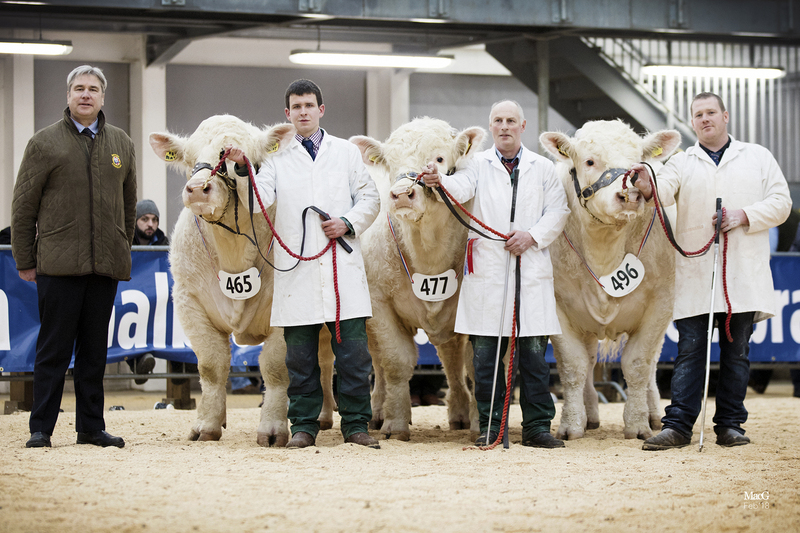 Just behind at 6,500gns was the cow and seven month old bull calf outfit Alsnow Hanna and Alsnow Oak. 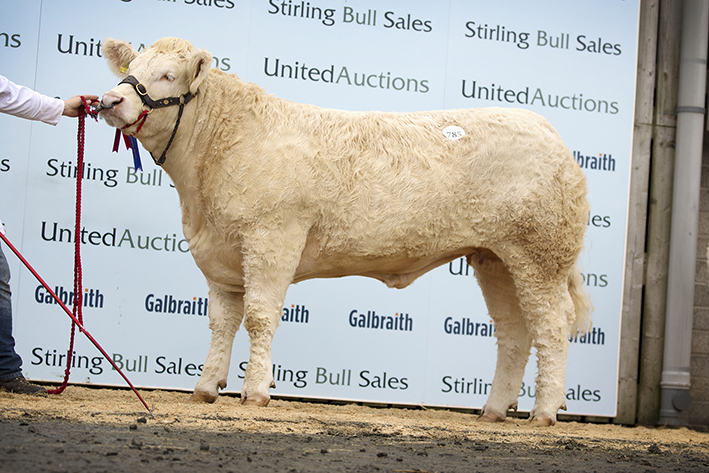 NA Wattie was the purchaser of the pair and takes them home to his Aberdeenshire unit. 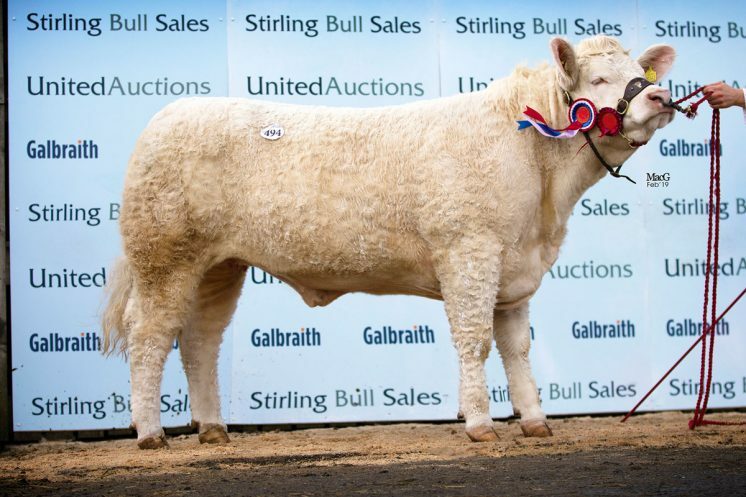 Hannah, a 2012 lass by the 16,000gns Stirling junior champion Clyth Diplomat is out of the aforementioned Enchantress and her son is sired by Cottage Devon. 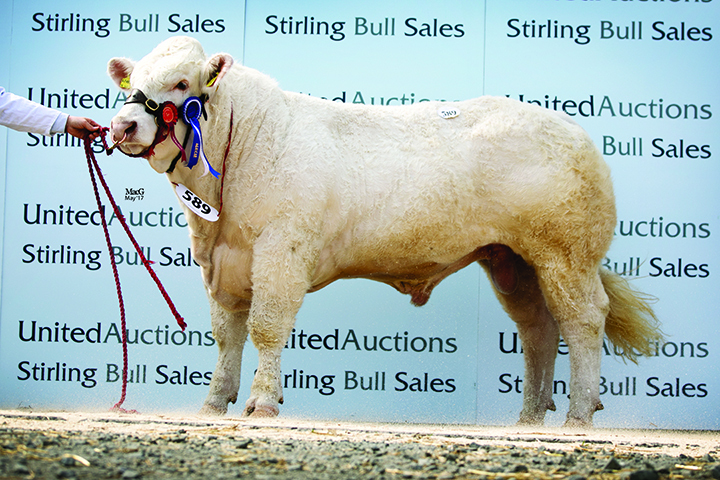 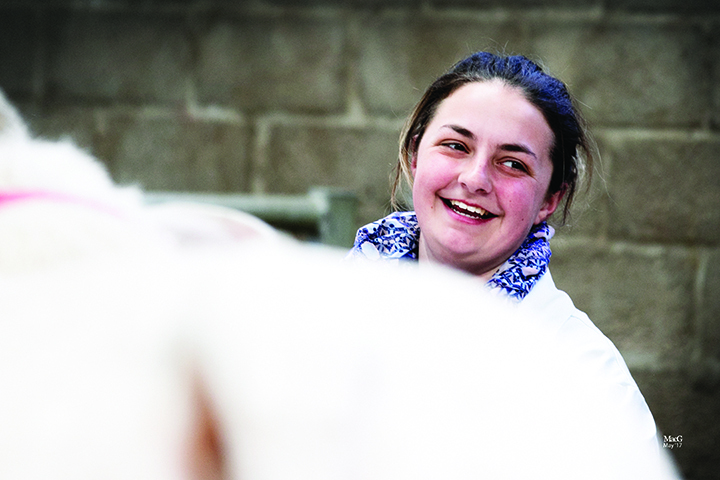 Averages: 121 bulls £6,063; 14 heifers £3,906; 13 Alsnow cow and calves £5161; one Alsnow heifer £1,700gns. Charolais took the top price, made the highest average and sold the most bulls at the Autumn round of Stirling bull sales this week. 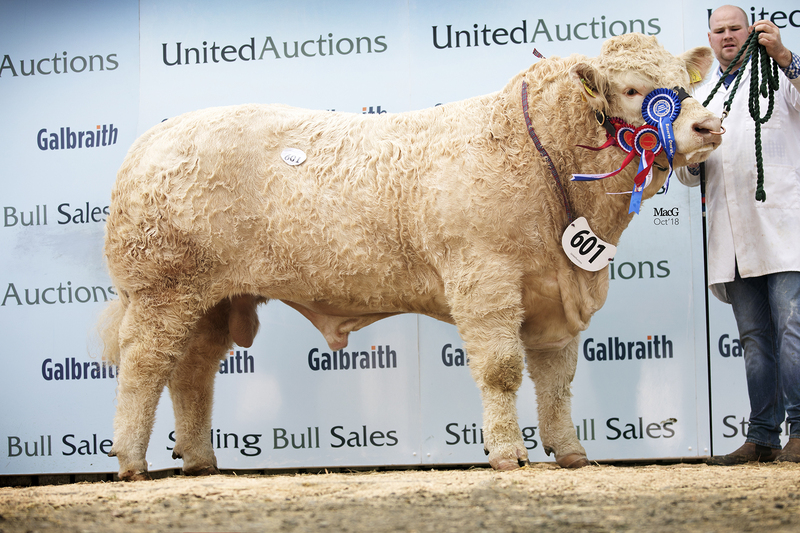 80 bull sold to average £6,785.63 – £706 up on the year and clearing at 81%. 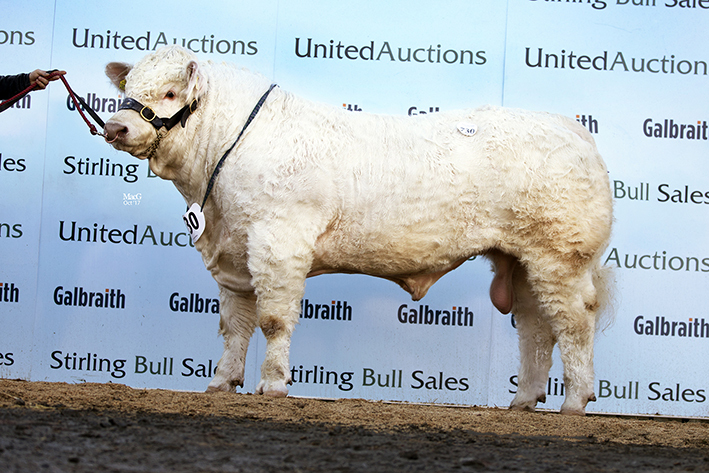 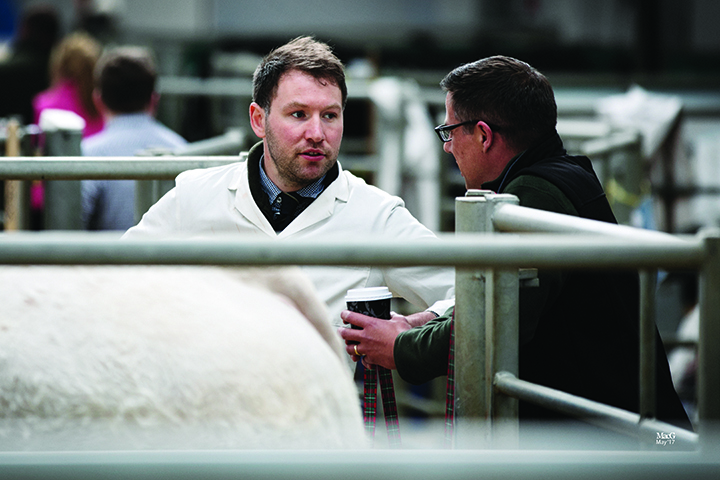 Prices topped at 40,000gns and 12 bulls made five-figure sums while a further 31 sold for 5,000gns and above. 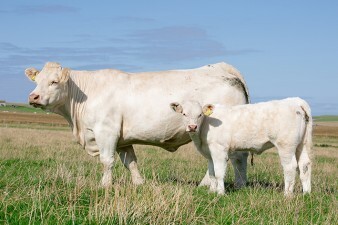 Society CEO Peter Phythian commented “We are delighted with the trade, especially considering the issues with beef prices and the drought during the summer. 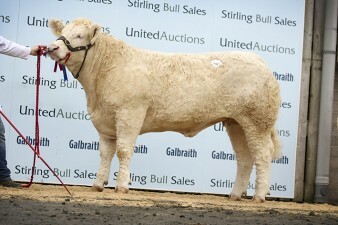 It just goes to show that commercial farmers want a breed with a real premium that can finish quicker than any other”. Leading the bids at 40,000gns was one of the youngest lots of the sale, Maerdy Newman. 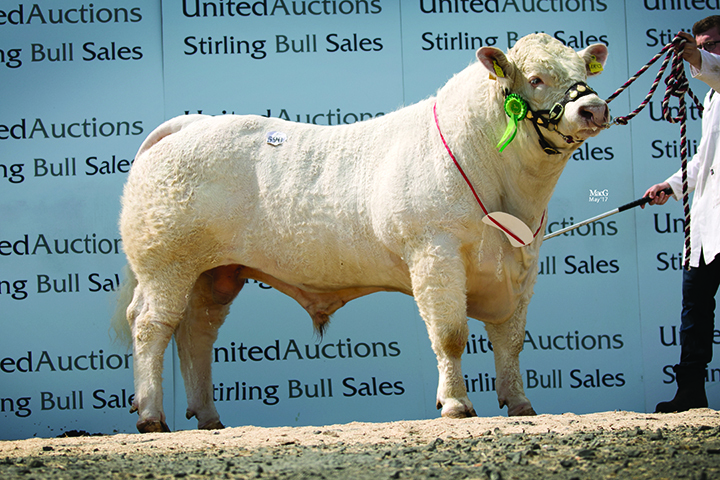 This June 2017 born son of the 10,000gns Stirling reserve senior champion Blelack Fabulous and Maerdy Dynamite-sired Maerdy Junco was snapped up by Boden and Davies, Stockport, Cheshire. 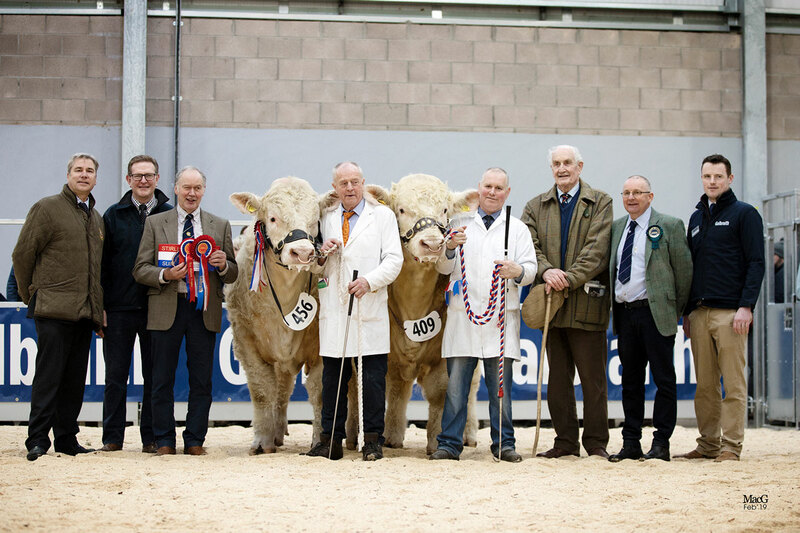 Breeder and exhibitor and Flintshire Vet Esmor Evans, was delighted with his day, selling a total of five bulls averaging £13,860. 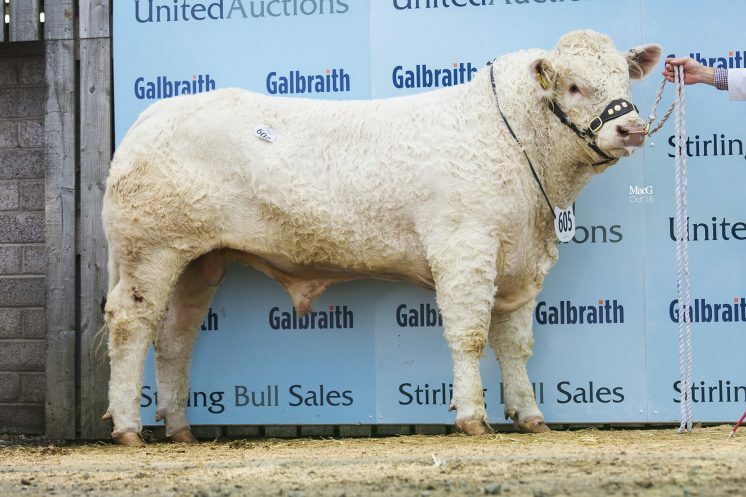 He commented “I knew he was an exceptional bull, and this was proven by the immense interest shown in him this week which was reflected in his price”. 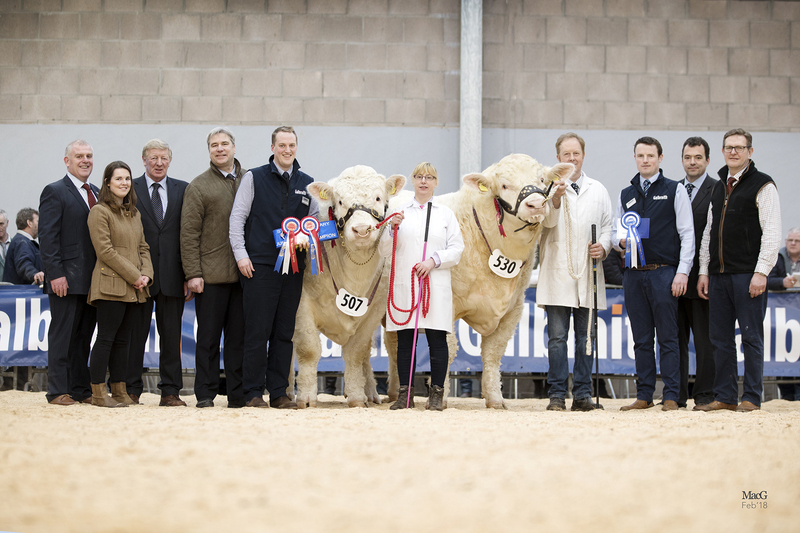 Securing a price of 12,000gns was the reserve supreme and junior champion Coolnaslee Nolan, who was also shown at Balmoral this year and crowned male champion for breeder and exhibitor Jonathan Crawford, Maghera, Co Derry. 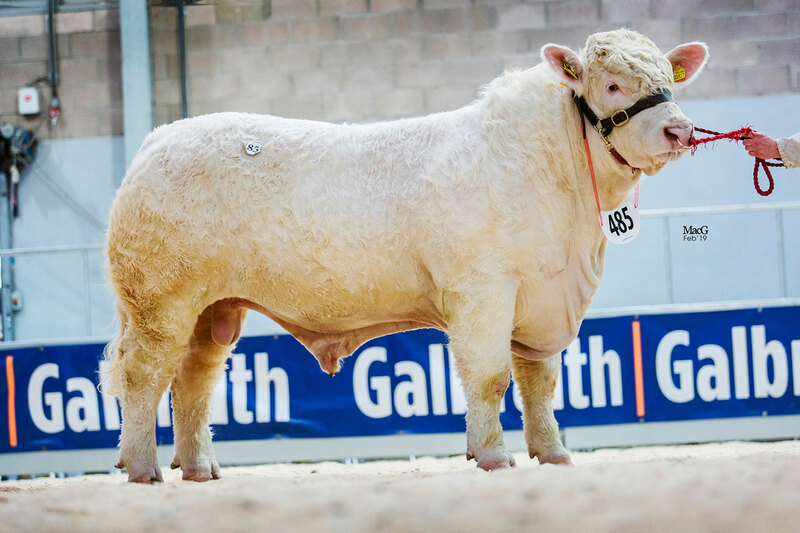 A son on the 50,000gns Stirling reserve supreme champion Balthayock Justice and Clogher show reserve female champion Coolnaslee Gillian, a 55,000gns Balmoral show interbreed champion Sportsmans Columbo daughter, this May 2017 born lad caught the eye of purchaser JI Stout, Stronsay, Orkney. 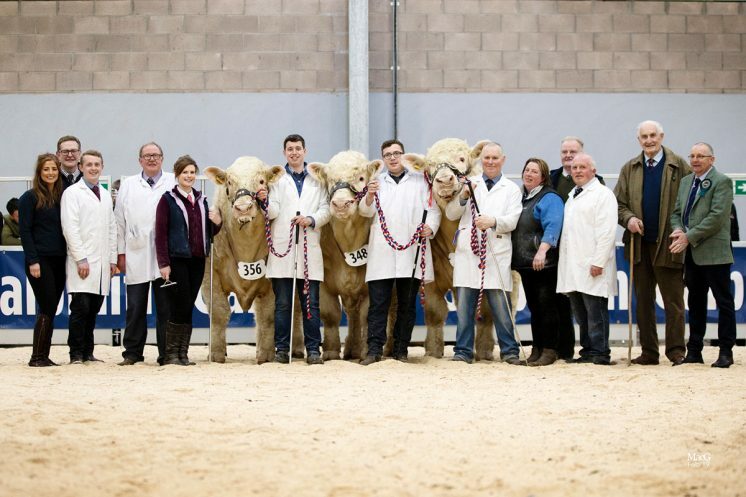 The first of three futher lots making 10,000gns was a class winner from Roy and Matthew Milne, Lhanbride, Morayshire, who was also crowned junior interbreed champion, reserve Beefbreeder champion and reserve breed male champion at this year’s Royal Highland show. 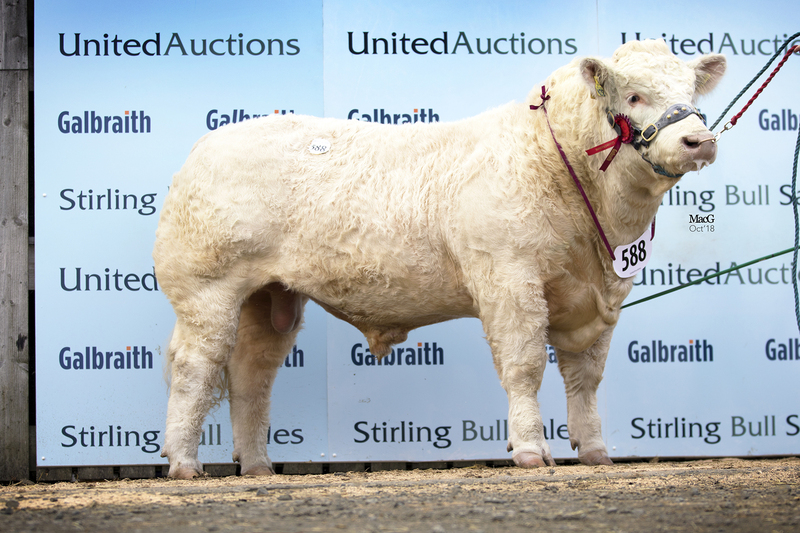 Elgin Neuer, a March 2017 born son of the 11,000gns Woodpark Elgin and Rumsden Samurai-sired Elgin Ultra goes home to work in Killeranan, Muir of Ord for WJ Jack and Sons. 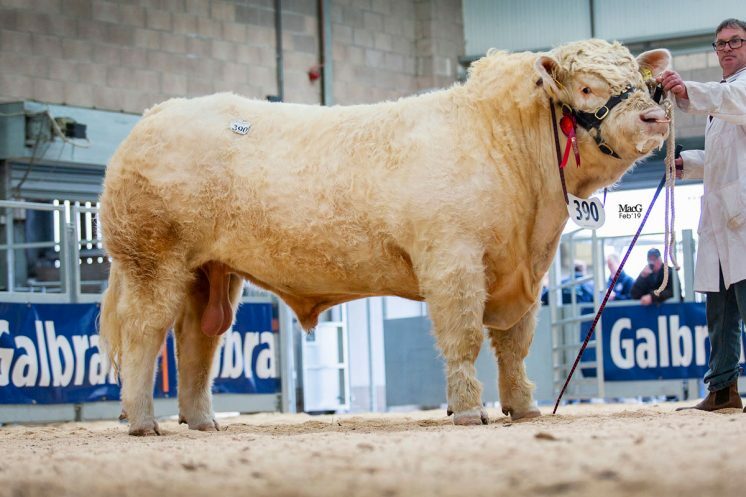 The next 10,000gns lot was Brampton Nutella, who not only topped his class at the presale show but also claimed a red rosette at this year’s National show in July. The aforementioned Billy Turner who had earlier purchased the sale supreme champion presented this 18 month old lot. 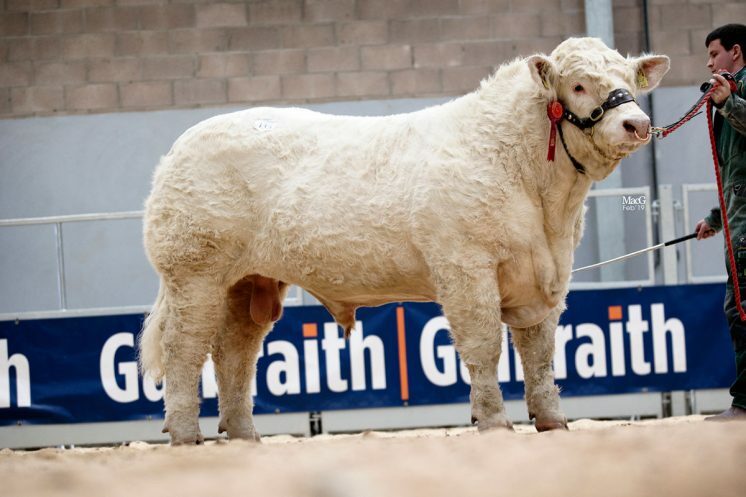 Nutella who was purchased by A O’Rouke, Newry, Co Down, is among the first bulls to sell by Cumbrian bred Border Jamboree, whose daughters have been retained, while the dam is the Billingley Siralex -sired Brampton Daylight, a Great Yorkshire show interbreed champion. 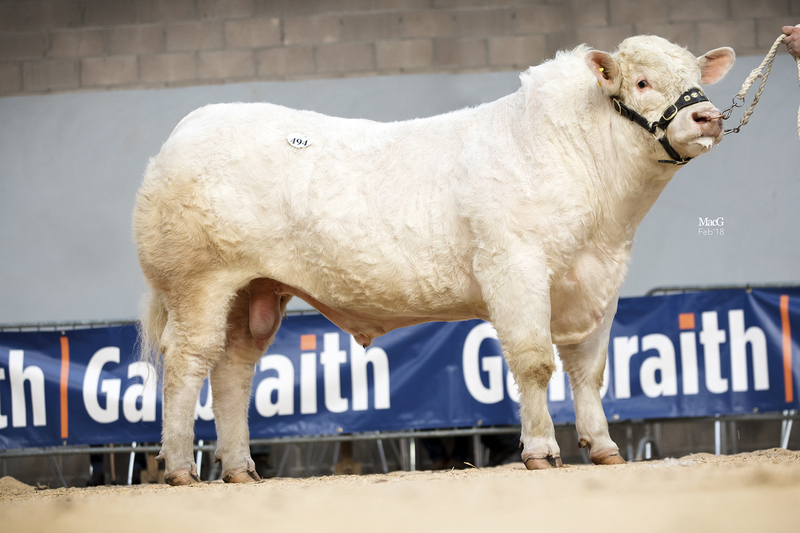 Another to secure 8,500gns was a May 2017 born son of the 18,000gns Thrunton Fairfax, whose dam Forglen Jenny is a daughter of the 9,000gns Royal Cornwall show and Great Yorkshire show reserve champion Gretnahouse Archangel. 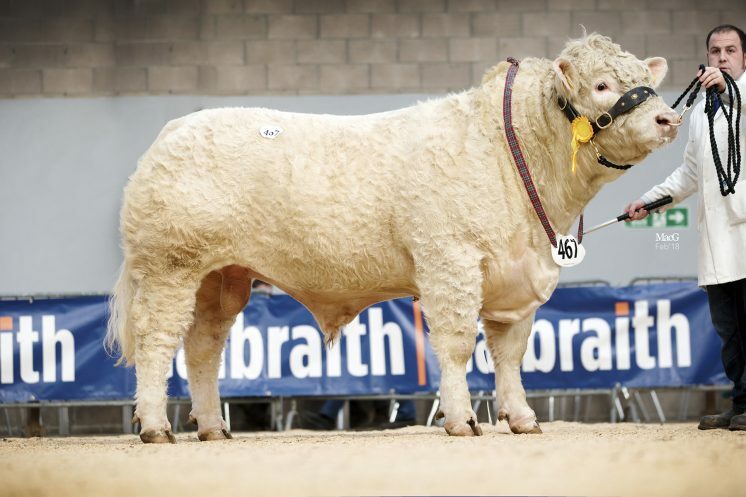 Forglen Nero, who was this year’s Turriff show male champion from Eric and Ellis, Mutch, Banff, Aberdeenshire, was purchased by J Hyslop and Son, Biggar, Lanarkshire. 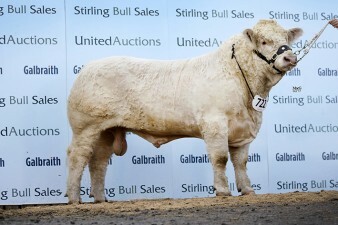 Top priced purchasers Boden and Davies Ltd, also produced an 8,500gns bull. 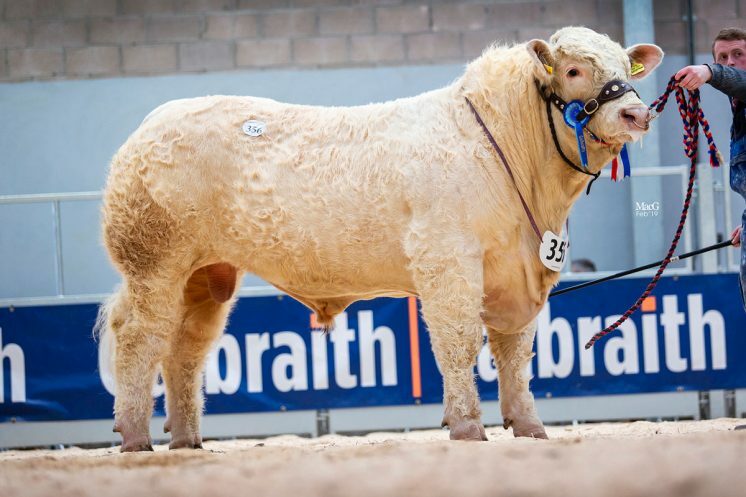 Sportsmans Nero, a 16 month old, who was awarded a blue ticket in the pre-sale show goes on to work in Nairn, Invernessshire with new owners JM Forbes and Son. 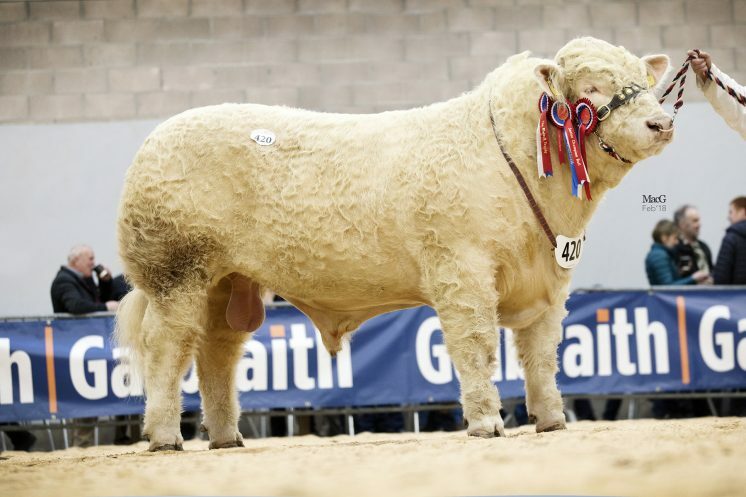 His sire Goldies Jerry is a 26,000gns Royal Welsh show male champion and his dam Sportsmans Harriet is a daughter of the 70,000gns Royal Welsh Show supreme champion Barnsford Ferny. 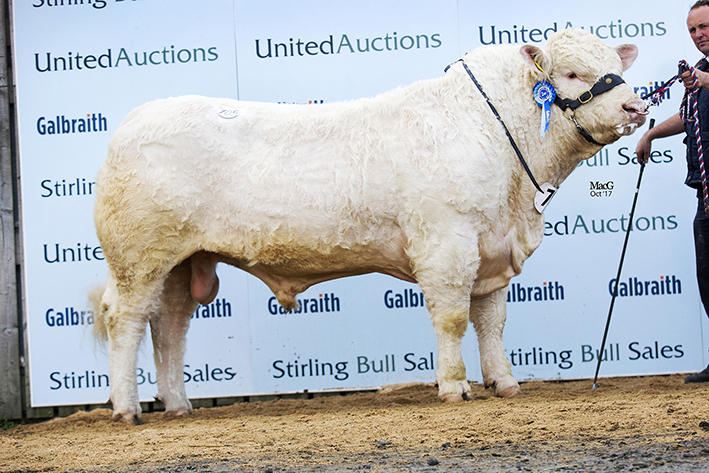 The final two 8,500gns lots were both consigned by top priced bull seller Esmor Evans. Also sons of Blelack Fabulous, Maerdy Ned and Maerdy Newel found new homes in Invernessshire and Orkney respectively. The May 2017 born Ned is out of the 13,000gns Balthayock Eagle-sired Maerdy Juice and was purchased by W Duncan and Co, Insch, while the June 2017 born Newel is out of Maerdy Honney, sired by the French-bred Froufrou, and caught the eye of T Leslie, Shapinsay. 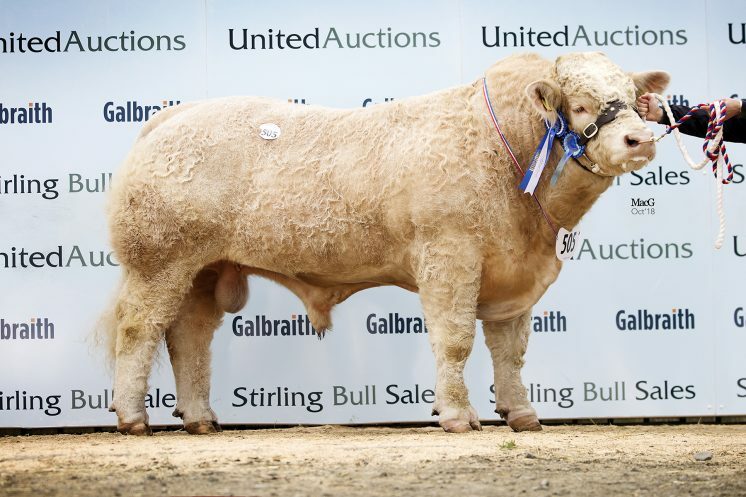 Completing the top 20 prices at 8,000gns was Goldies Nobel, the pre-sale show reserve intermediate champion from Hamish Goldie, Ruthwell, Dumfries. Purchased by Kincraigie Farms, Banchory, Aberdeenshire, he is out of the 15,000gns Gretnahouse Heman daughter Goldies Joey and sired by Blelack Blackberet. 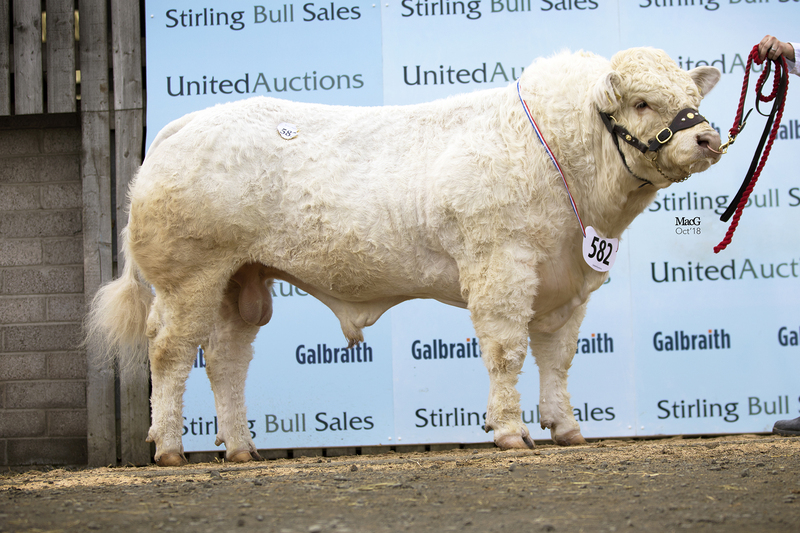 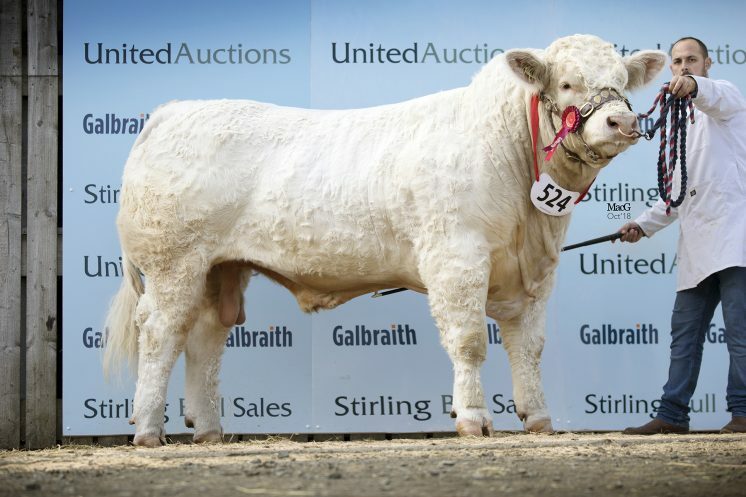 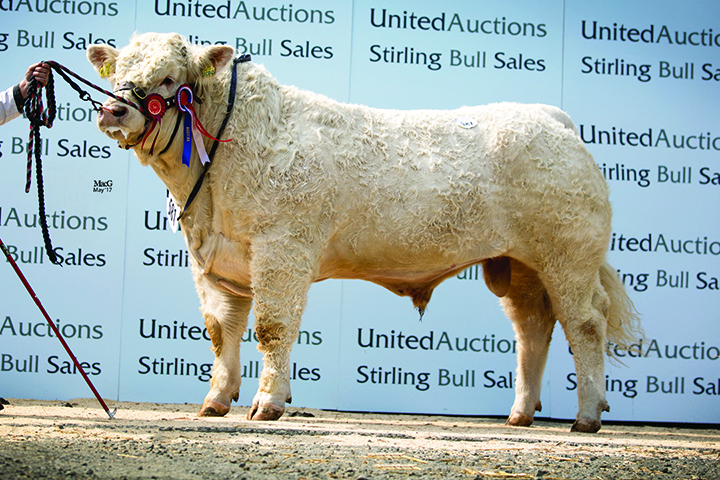 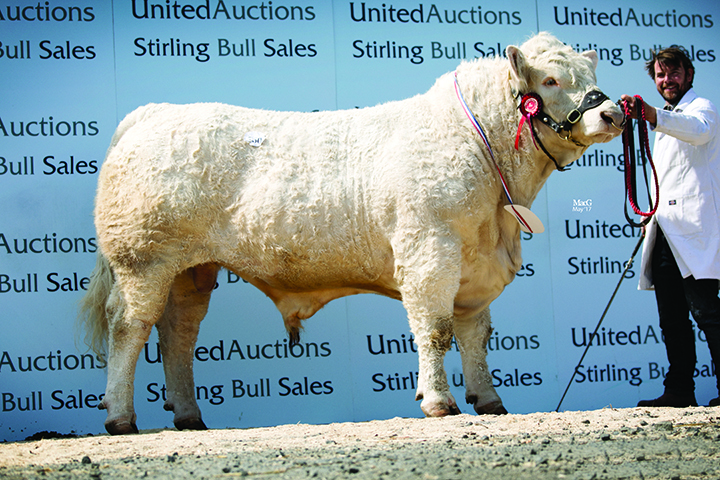 Trade held up well at the Charolais Society sale where buyers came out in force to ensure a steady demand which resulted in the averages improving by £815 from last year, at Stirling on Monday 7 May. 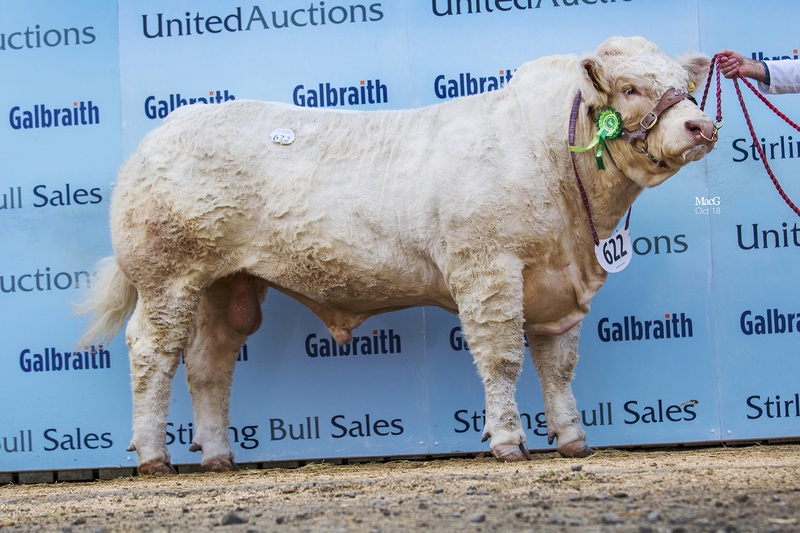 Bidding peaked at 9,200gns, 15 lots traded at five thousand and above and 27 bulls sold to an average of £5,402 with and 82% clearance rate. 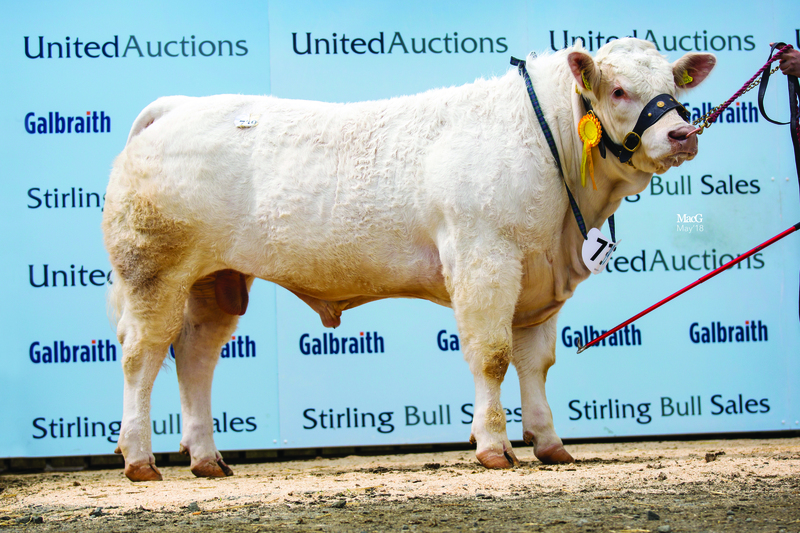 The sale leader was the September 2016-born Goldies Moonlight from the day’s top selling vendor Hamish Goldie, Ruthwell, Dumfriesshire, who sold four bulls averaging £8321.25 apiece. 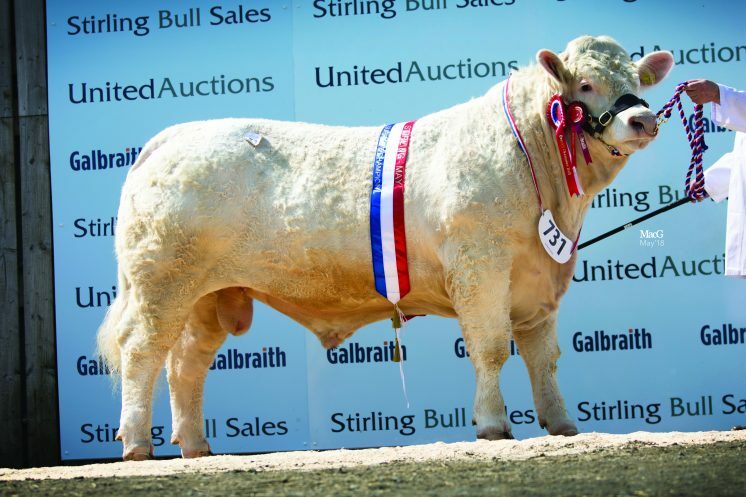 Moonlight is sired by the top performing 15,000gns Gretnahouse Heman, while his Dam Goldies Judy is from same female line as the Stirling February top priced female and champion Goldies Madame who is herself sired by the 34,000gns Perth supreme champion Goldies Uppermost. 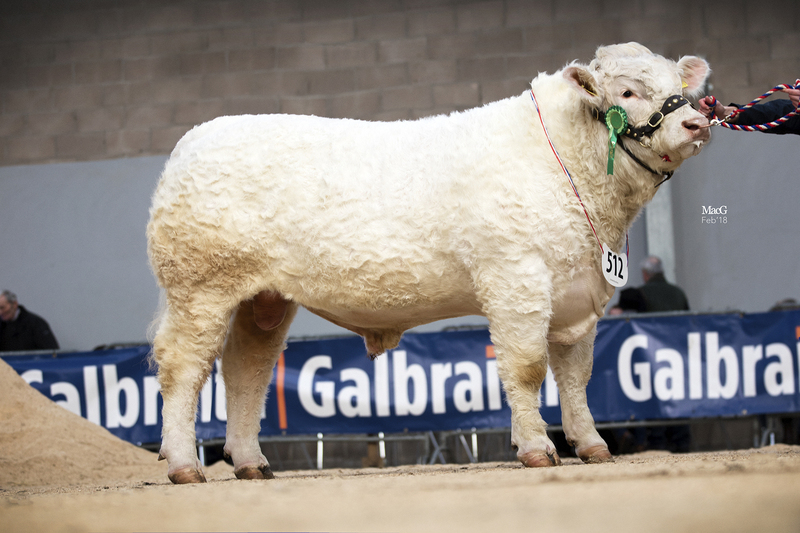 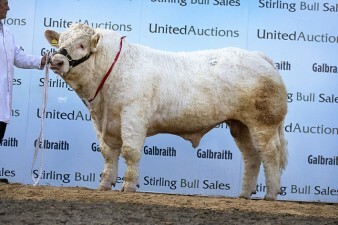 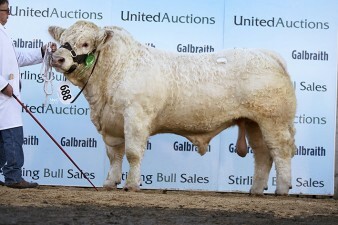 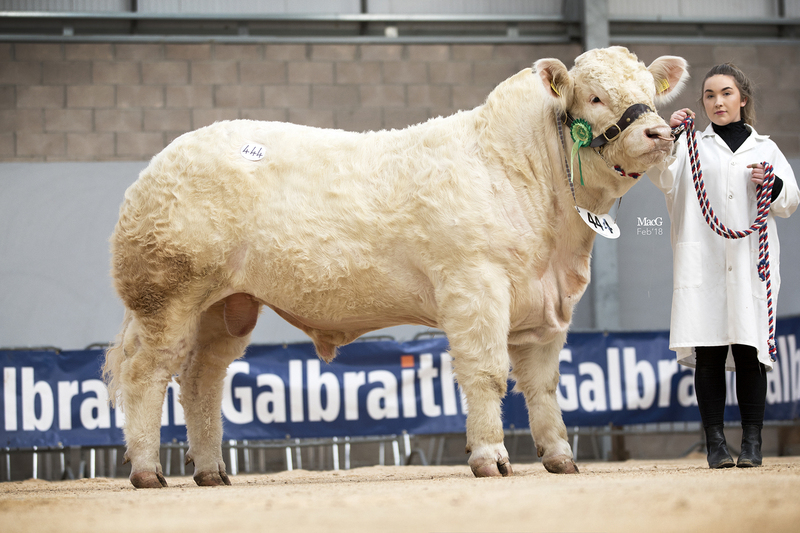 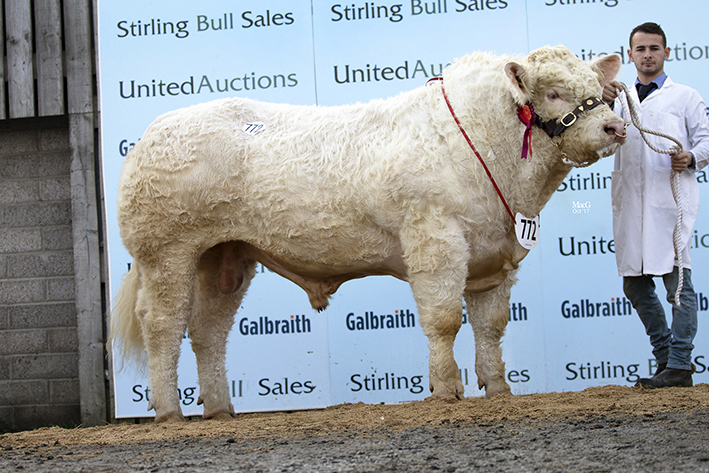 The successful bidder at 9,200gns was Colin Morrison from Lochboisdale, Isle of South Uist. 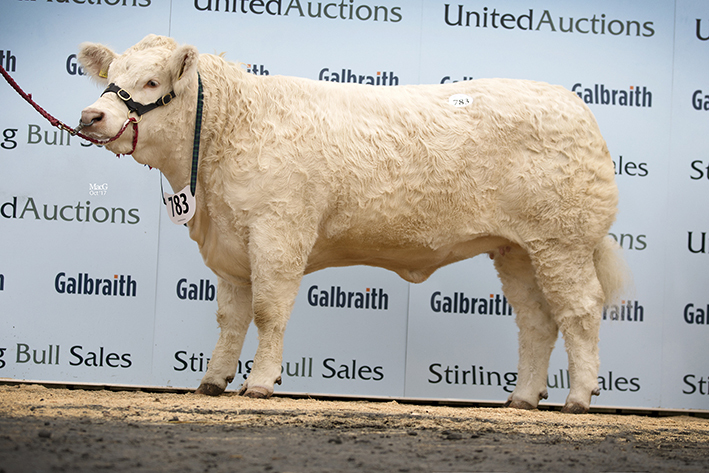 Also in the money at 7,800gns for Mr Goldie was the yellow ticket winner and 18-month-old Goldies Moonbeam who caught the eye of Mr Macintyre, Southend, Argyll. He is the first son for sale by the homebred and retained Goldies Jetset and his dam Goldies Hazel, who goes back to the 12,000gns Goldies Elation has previously bred an 8000gns son. 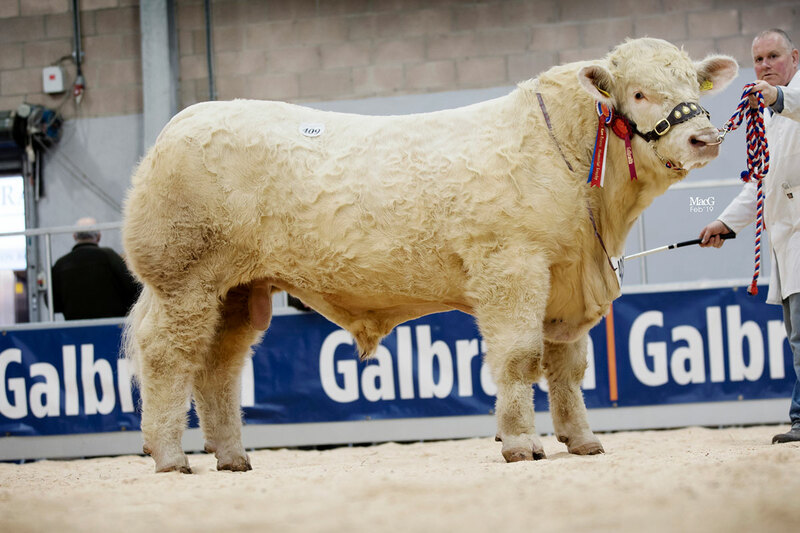 Next to sell for Mr Goldie at 7,500gns was Goldies Mercedesbenz who stood second in his class at the pre-sale show. 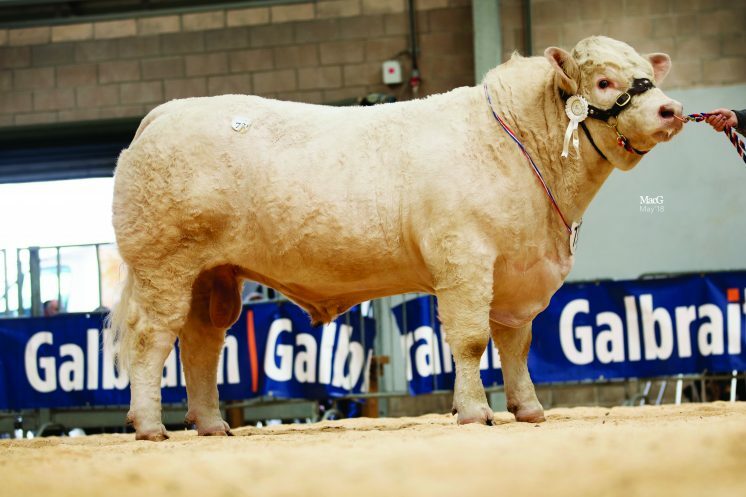 His dam Goldies Irene is a daughter of Blelack Blackberet and he is sired by the short gestation easy calving Goldies Formidable who has bred over 100 progeny into the herd and produced 23,000gns and 26,000gns sons. The November 2016-born Mercedesbenz was purchased by WSL Muir, Stenness, Orkney. 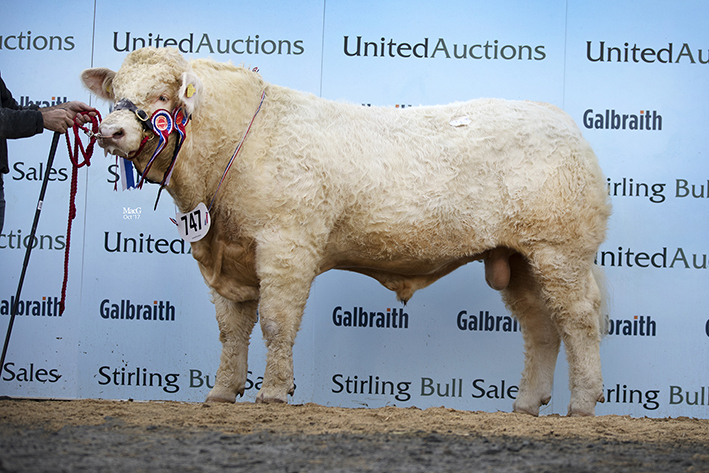 Goldies Michael, the final top price offering from Hamish Goldie, was snapped up for 7,200gns by the Aitken Bros, Linlithgow, West Lothian. Michael is a 19-month-old heifer’s calf by the aforementioned Gretnahouse Heman, his dam Goldies Jean goes back to Goldies Formidable. 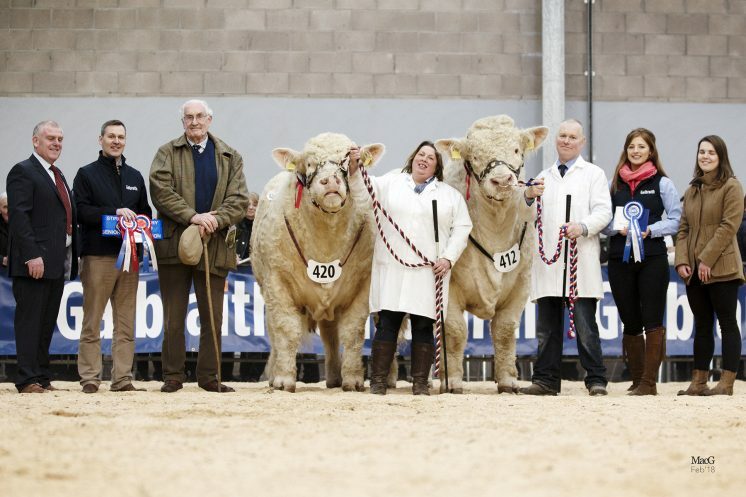 The days reserve champion came from the JHC Campbell & Sons, Alnwick, Northumberland and is by Thrunton Gladiator who has sired more than 160 progeny into the herd. 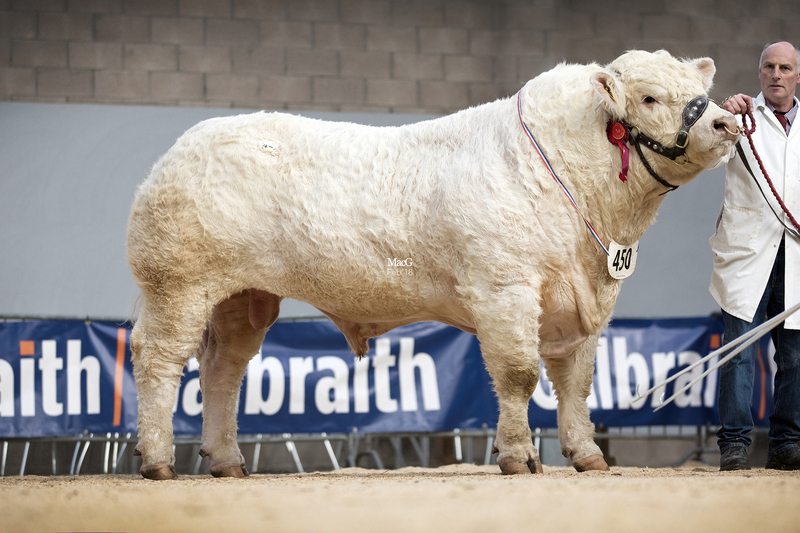 The June 2016-born Thrunton Maestro, who was purchased for 8,000gns by G Wilson and Son, Glenkindie, Aberdeenshire, is out of Thrunton Hirondelle who goes back to Thrunton Doubletop. 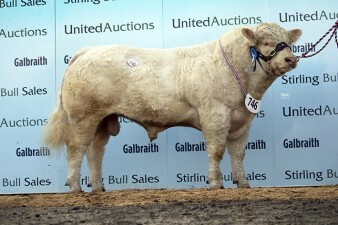 Next from the same vendor was another Gladiator son. Thrunton Monty, a 19-month-old, whose dam Thrunton Amelia is sired by the 15,000gns Carlisle supreme champion Burradon Talisman, was purchased by Lour Farms, Ladenford, Angus, for 5,500gns. 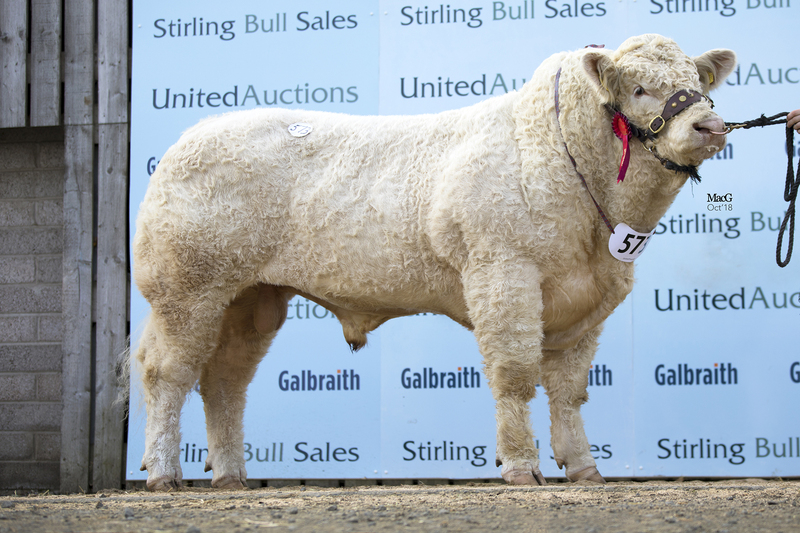 Purchased for 7,500gns by the RSPB, Loch Gruinart Reserve, Isle of Islay, was the 11,000gns Woodpark Elgin son Spittalton Newton. Newton’s, a 15-month-old whose dam Elrick Idelle is a daughter of the 11,000gns Maerdy Dublin, was offered for sale by John Burnett and Sons, Blairdrummond, Stirlingshire. 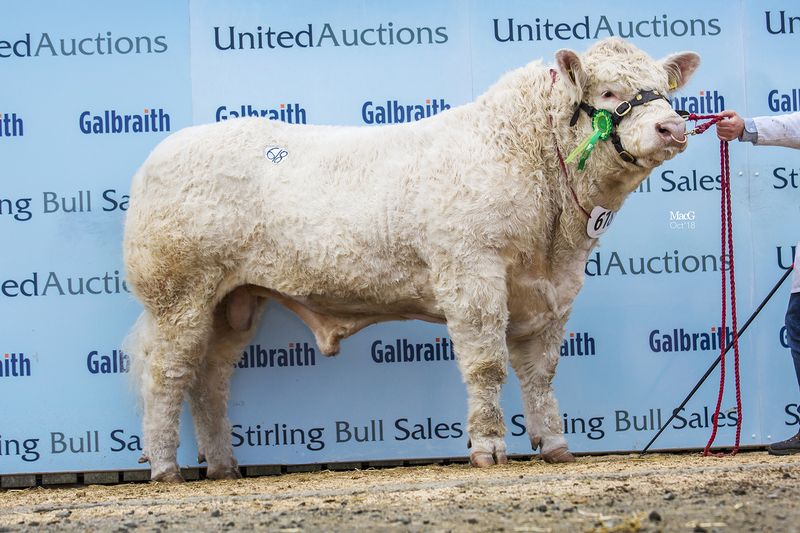 The next highest price of 6,500gns was paid for Baillieston Mint, a yellow ticket winner from Ronnie Baillie, Toab, Orkney. 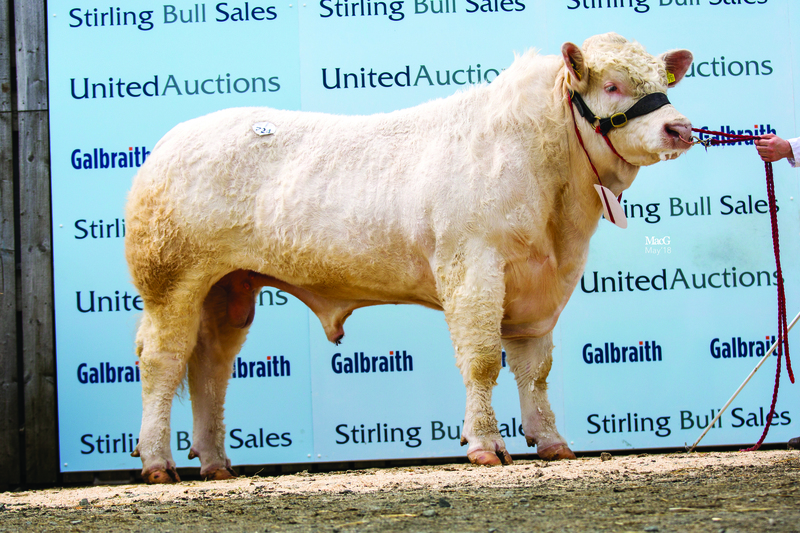 Sired by the 25,000gns Stirling supreme champion Maerdy Hasse and out of Baillieston Gretel, a 15,000gns Maerdy Deiniol daughter, the May 2016-born Mint was knocked down to Glenpark Farms, Balerno, Midlothian. Two bulls then came under the hammer for 6,200gns, with the first being a 19-month-old class winner Spittalton Maverick from the aforementioned John Burnett and Sons. Out of the same dam as Newton but this time sired by the 31,000gns Carlisle reserve supreme champion Whitecliffe Highlight, he was purchased by C and C Adam, Cushnie, Aberdeenshire. 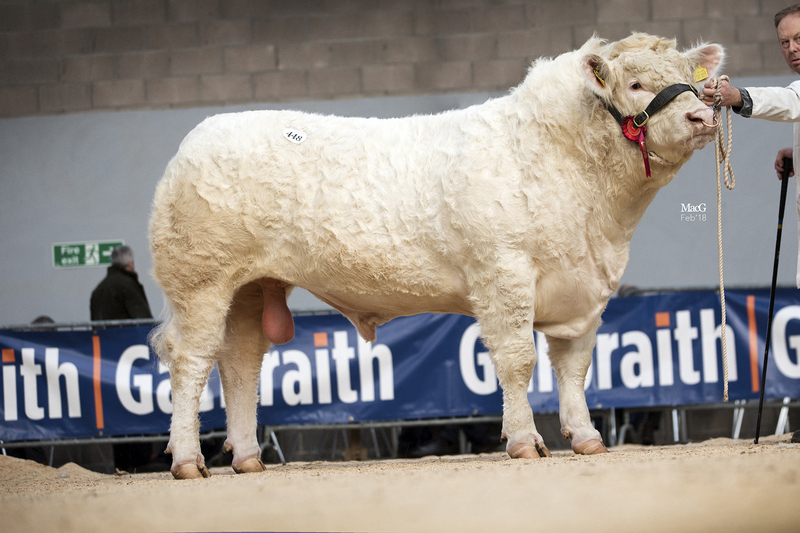 Matching the 6,200gns price tag was a November 2016-born entry from Peter and Allen Drysdale, Blairgowrie, Perthshire. 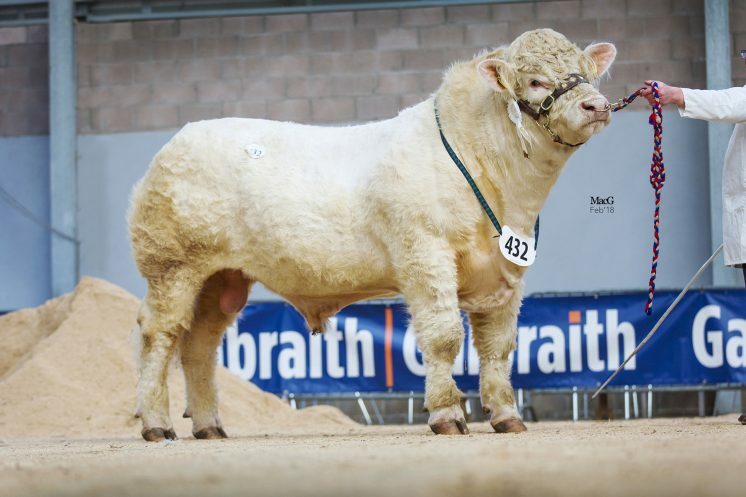 Glenericht Manhatten, caught the eye of J and R Mitchell, Auchterarder, Perthshire, is out of the Blelack Digger-sired Glenericht Glamourgirl and by the 15,000gns Highland Show junior beef cattle interbreed champion Maerdy Hwre. 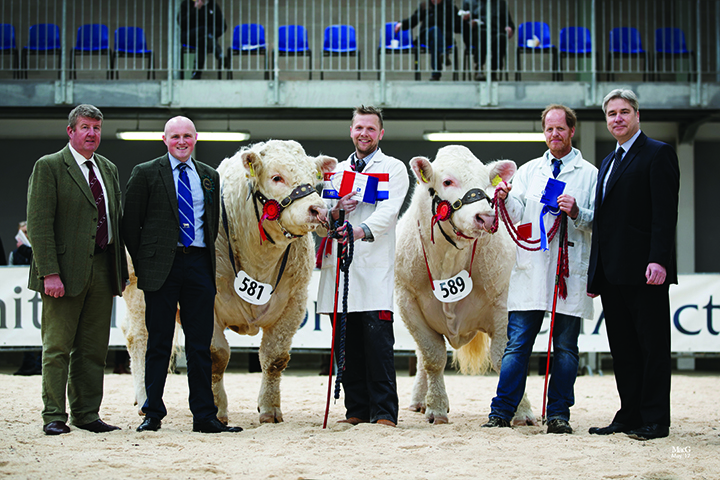 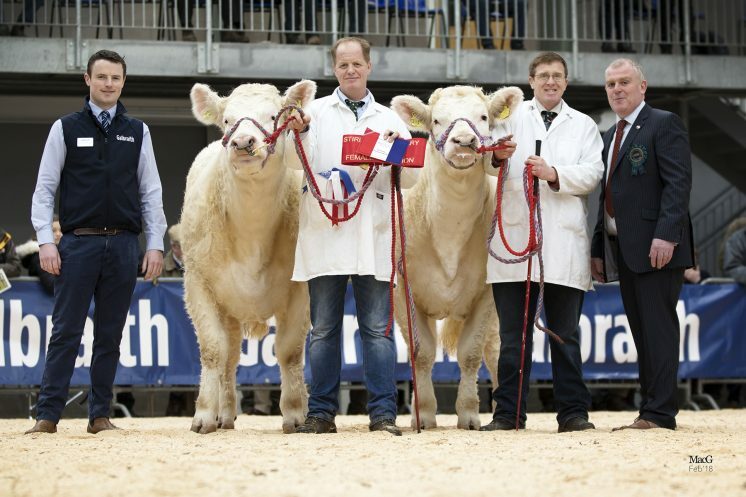 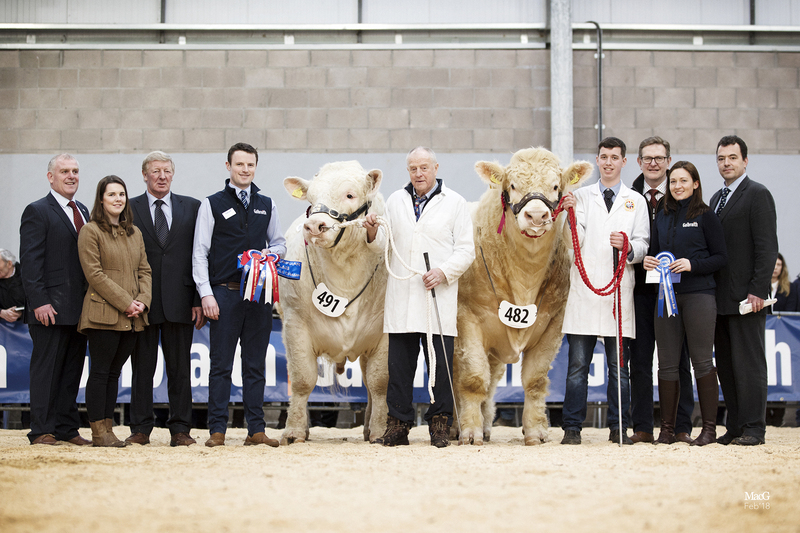 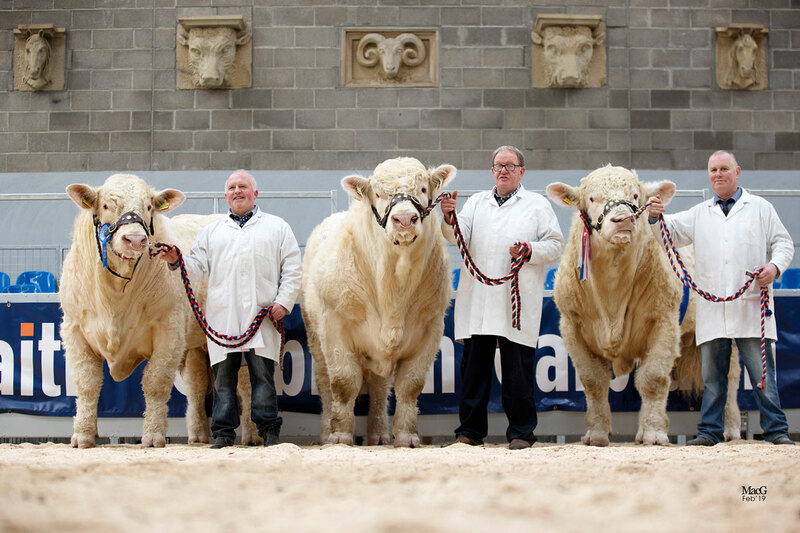 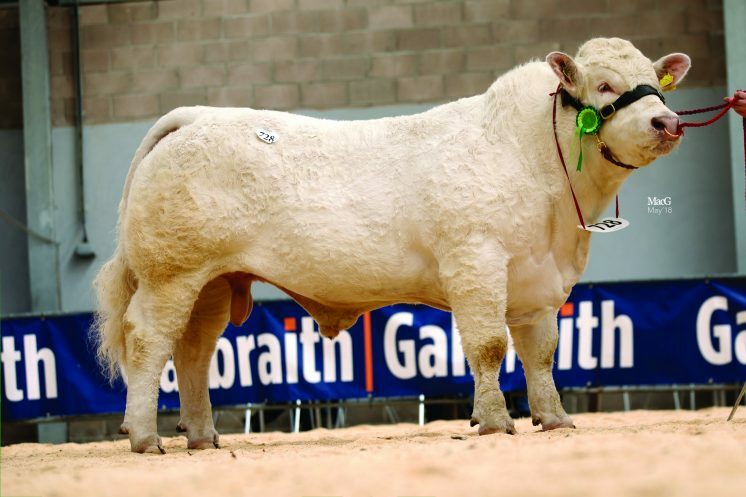 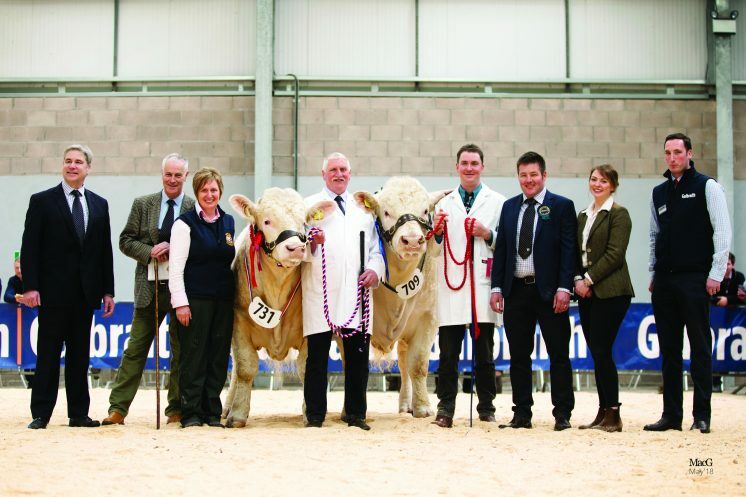 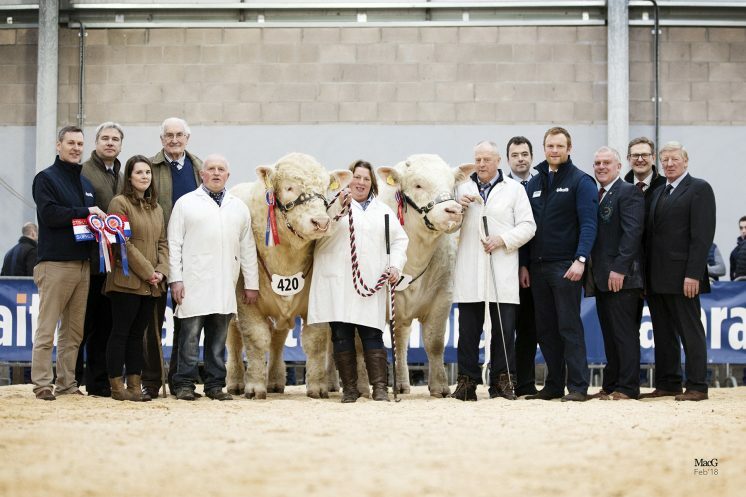 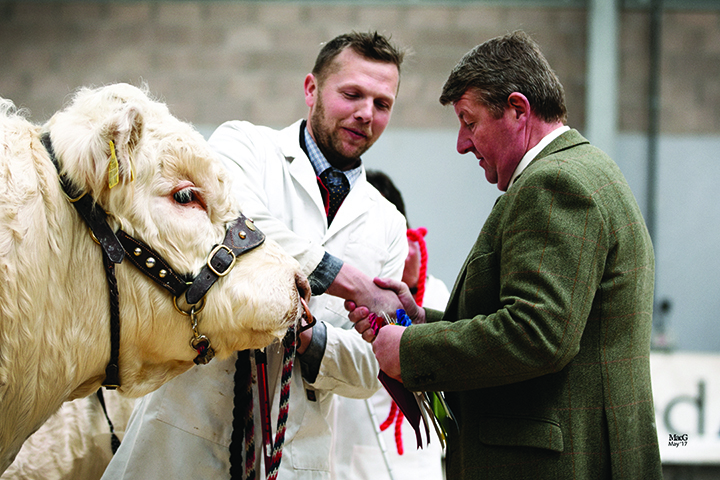 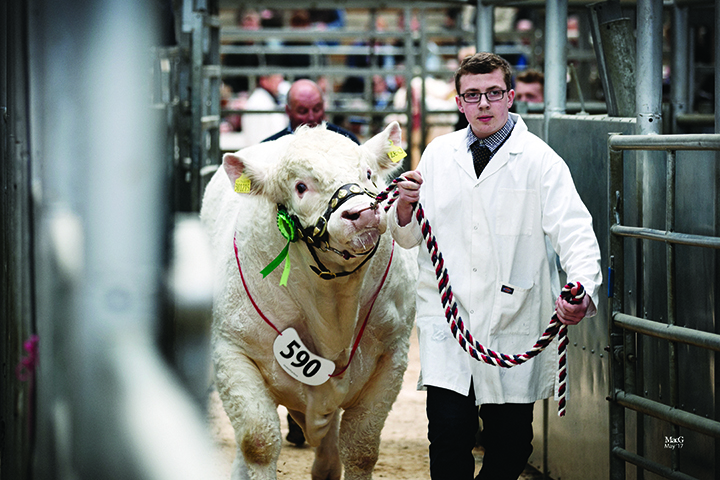 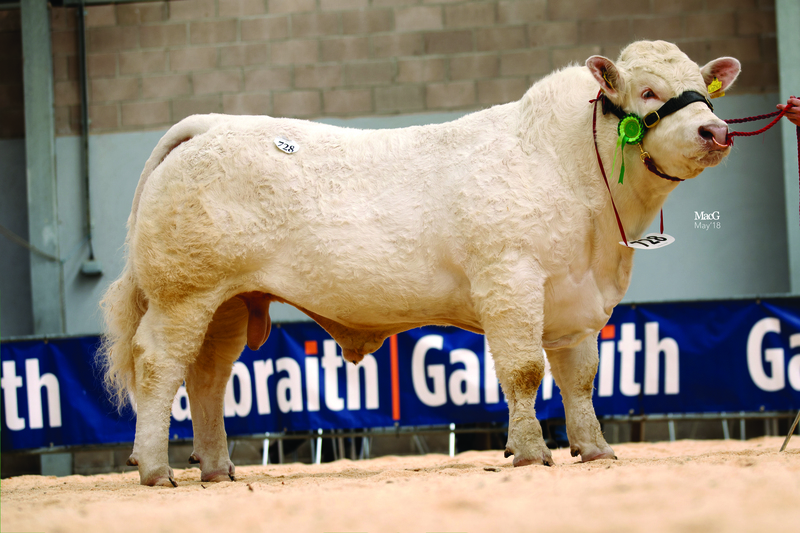 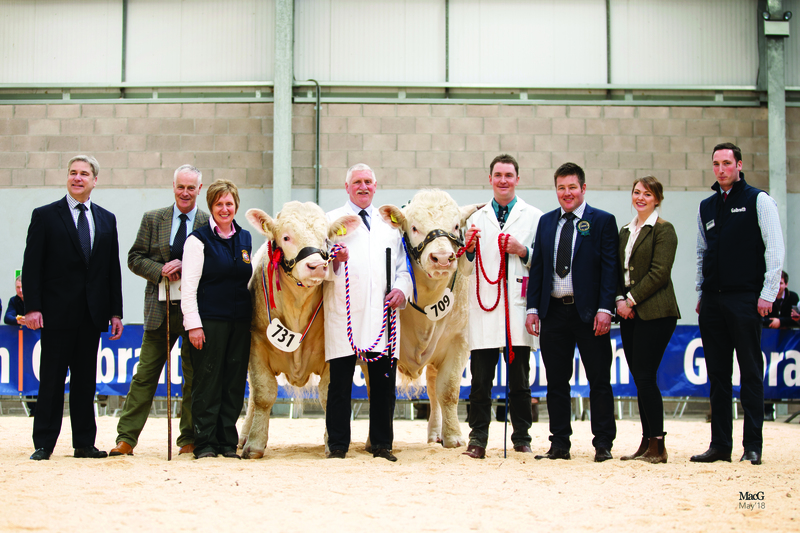 T Dun and Sons, Heriot, Mid Lothian, were next to secure a Charolais bull, when they paid 6,000gns to take home the 20-month-old Kersknowe Messiah. 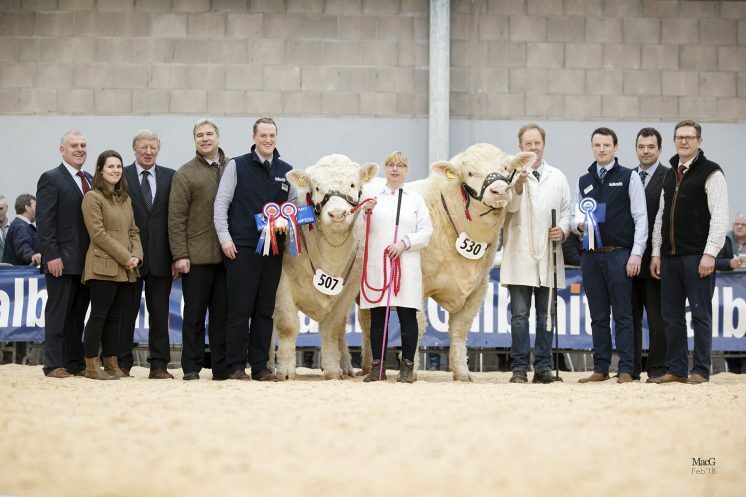 The breeding here includes the 20,000gns Stirling supreme champion Inverlochy Fencer and the 13,000gns Perth reserve senior champion Elrick Solution daughter Kersknowe Alana. 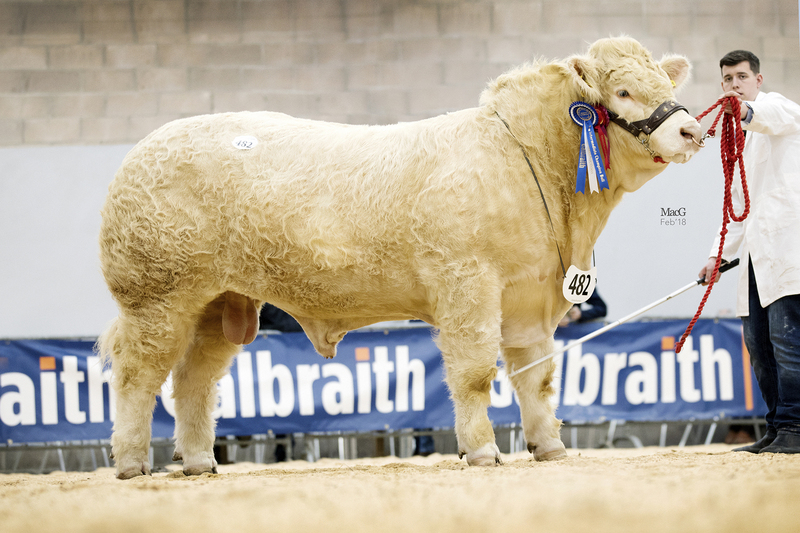 Messiah who was bred and exhibited by James Jeffrey, Kelso, Roxburghshire, also secured a yellow ticket at the pre-sale show. 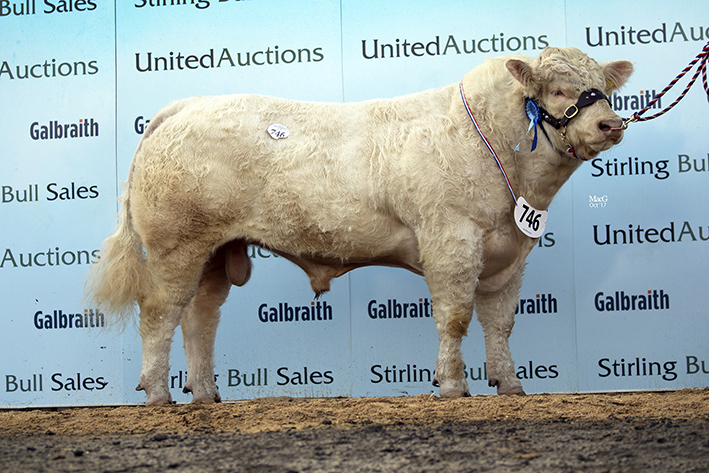 A class winner from Neil Barclay, Insch, Aberdeenshire, was next up, also selling for 6,000gns. Harestone Macbeth, a 19-month-old who is sired by the 16,000gns Stirling supreme champion Thrunton Fearless and out of the Irish-bred Barracks Ulna, goes on to work in Halkirk, Caithness for Alan Mowat and Sons. Mr Barclay went on to sell another top priced lot at 5,500gns, this time to W and A Strachan, Millfield, Aberdeenshire. Harestone Marsbar, a July 2016-born son of the 16,000gns Stirling supreme champion Thrunton Fearless and the 10,500gns Carlisle reserve supreme champion Gretnahouse Noel daughter Allanfauld Bandana. Minutes earlier, Aitken Bros, Linlithgow, West Lothian, paid 5,800gns for another of the above-mentioned Ronnie Baillie’s lots. 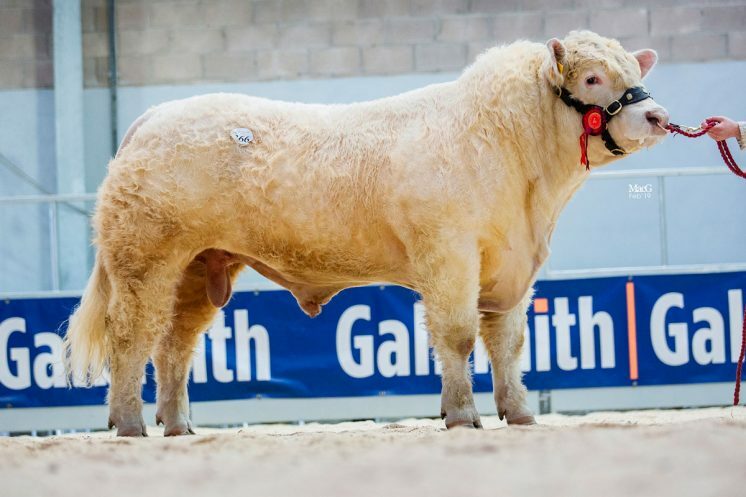 The 22-month-old and blue ticket winner Baillieston Morris, also sired by Maerdy Hasse is out of Baillieston Amy, who goes back to Haymount Royce. Also hitting the 5,800gns price tag was the day’s champion from Jim Muirhead, Arbroath, Angus. 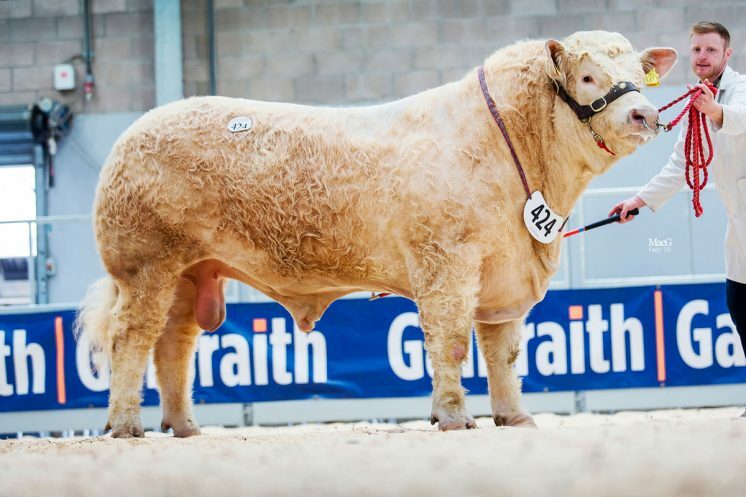 Firhills Majestic, a 17-month-old who is by the 20,000gns Royal Welsh show supreme champion Maerdy Grenadier, is bred out of the 14,000gns Perth reserve senior champion Goldies Banker-sired Ugie Heidi, and was purchased by June Mackenzie, Boat-Of-Garten, Invernessshire. 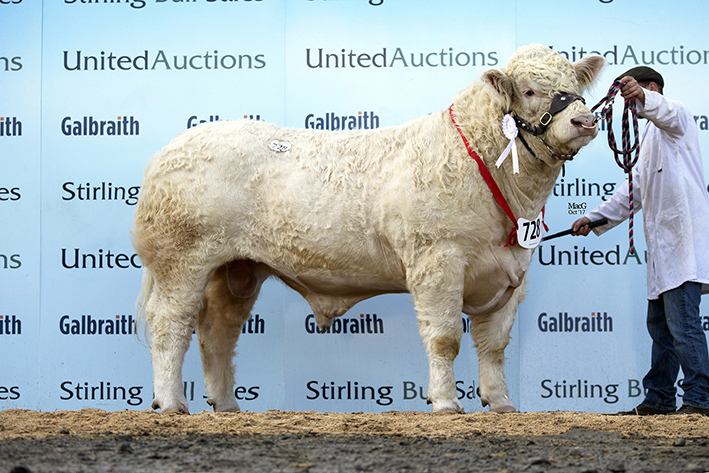 The sale leader at 8,500gns was the pre-sale show Champion Elgin Lochness from RA Milne and sons, Elgin, Morayshire. 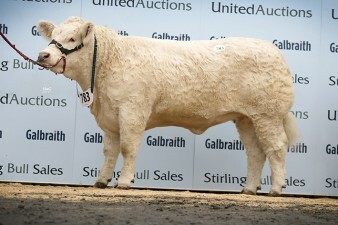 The 18-month old Lochness is sired by the 14,000gns easy calving Westcarse Houdini and out of the home-bred Elgin Heidi who goes back to the 10,000gns Thrunton Alpha and was purchased by Allan Mcarthur, Balfron Station, Glasgow. The purchasers seemed to agree with the pre-sale Judge Ellis Mutch as his choice for reserve champion was the next top priced. Bred and exhibited by Hamish Goldie, Ruthwell, Dumfries-shire, the November-2015 born Goldies Lively whose breeding includes sire the 15,000gns Gretnahouse Heman – who also sired the top priced bull Carlisle May 2016 – and home-bred dam Goldies Isabelle who is sired by the 34,000gns Goldies Uppermost sold in an 8,000gns deal to J and A Dunlop, Maybole, Ayrshire. 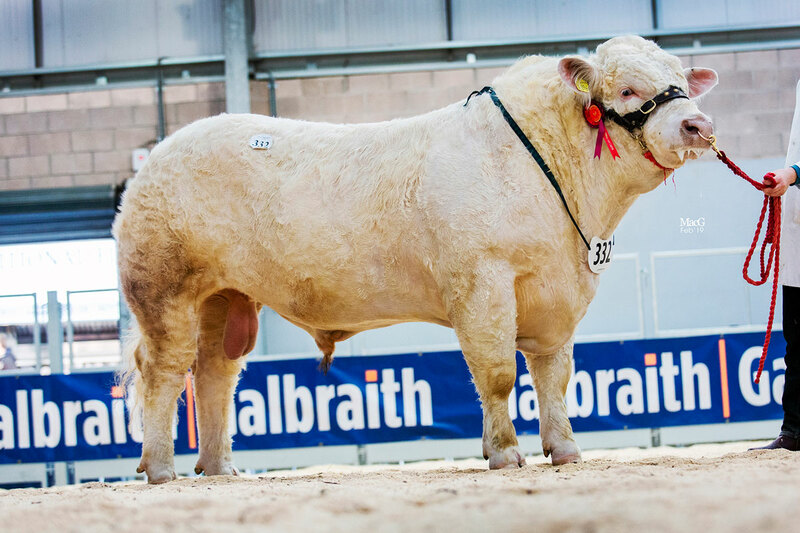 John Whiteford & Son, Cupar, Fife were the next to purchase, spending 6,000gns and taking home Inverlochy Lustre, a 22-month old son of the 11,000gns Blelack Giggsey and a home-bred dam going back to the seasoned show winner Inverlochy Resolve. 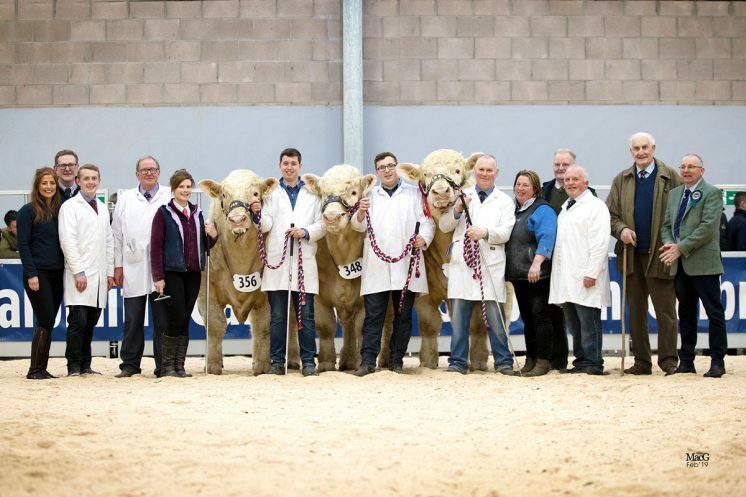 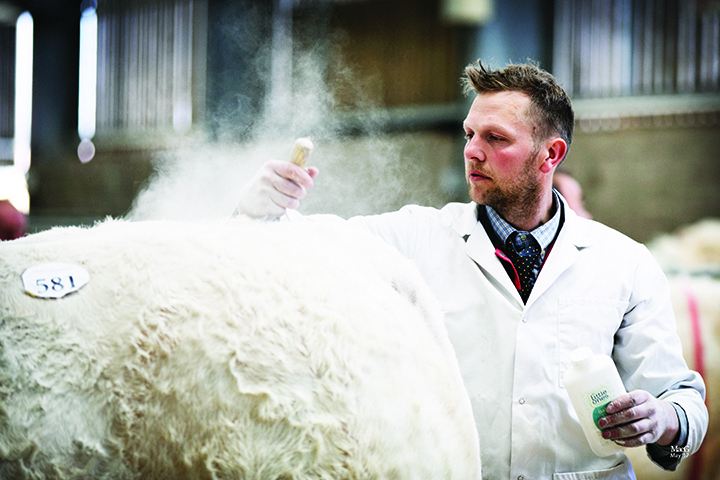 Lustre had himself shone in the showring when he was tapped out top of his class the previous day for exhibitors John Irvine and Son, Ballindalloch, Banffshire. Matching the 6,000gns price tag was the November-2015 born Linrossfarm Leo from Edward Scott, Glamis, Angus. 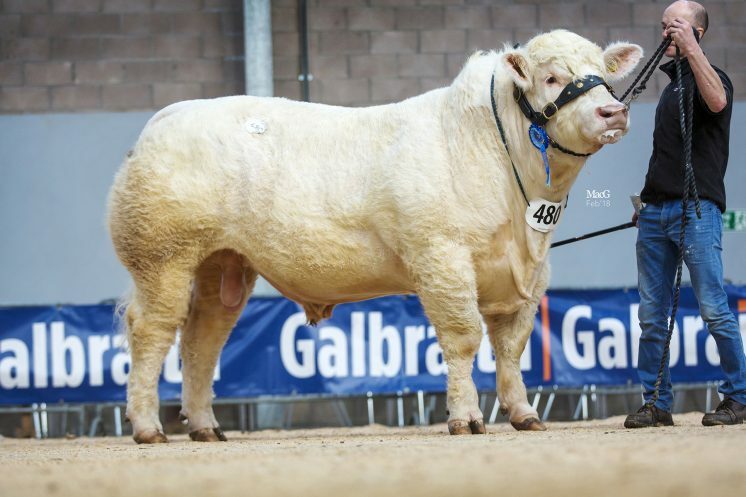 G Mccormick Snr liked the look of this yellow ticking winning son of the proven high performing short gestation and easy calving Blelack Digger and takes him home to work in Bridgend, Isle Of Islay. 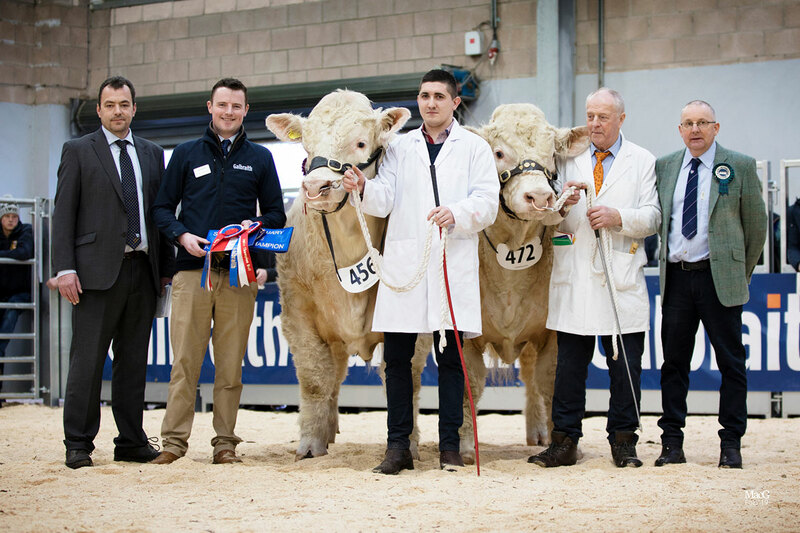 Close behind and the first of two to secure 5,800gns was Thrunton Lachlan who took the fancy of George Russell, Denny, Stirlingshire. 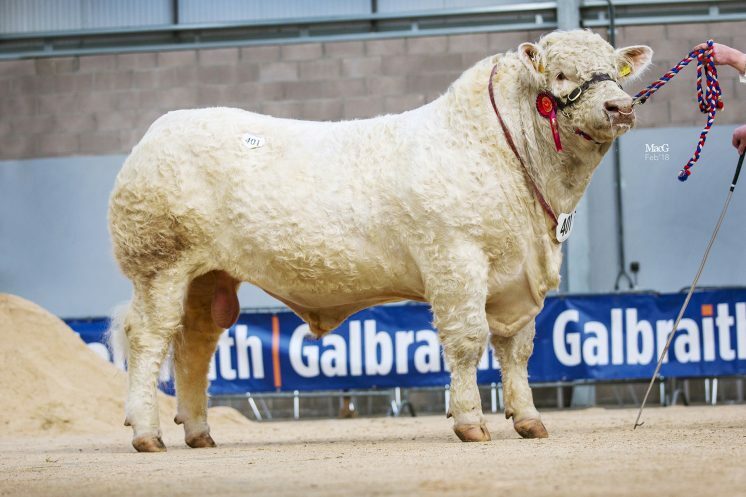 This 24-month old entry from JHC Campbell & Sons, Alnwick, Northumberland is sired by Thrunton Gladiator and his maternal grandsire is the 15,000gns Carlisle supreme champion Burradon Talisman. 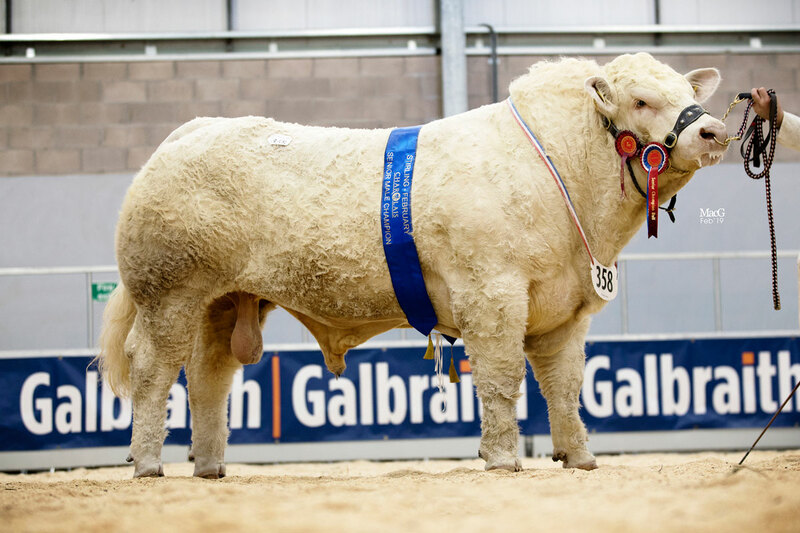 Hamish Goldie was back in the money also securing 5,800gns for another of his Gretnahouse Heman sons, this time out of Goldies Ingot going back to the 12,000gns Goldies Elation. 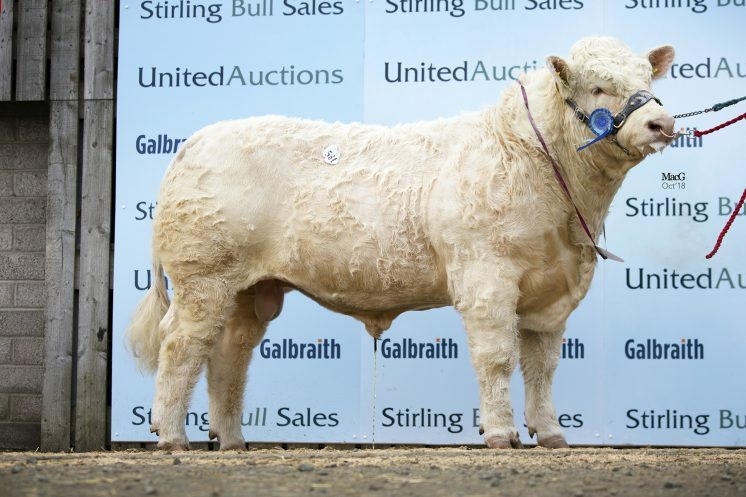 The November 2015-born Goldies Lionel sold to Colin McMillan, Bowmore, Isle of Islay. Next at 5,500gns was Gretnahouse Leapfrog for breeder Alasdair Houston, Gretna Green, Dumfries-shire. 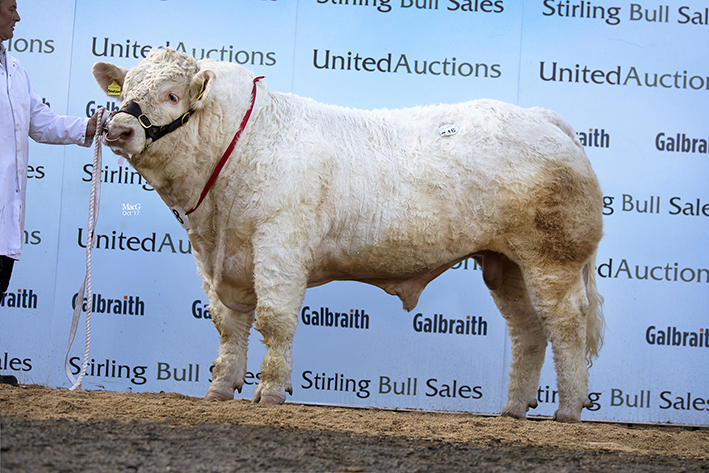 Another son of the popular Blelack Digger this 19-month old travels on to work in Lumphannan, Aberdeenshire with new owners S and J Urquhart. 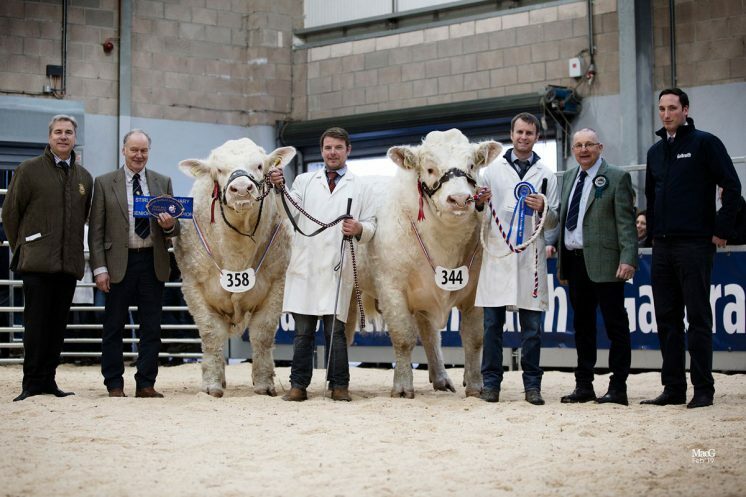 David and Nick Walter, Balthayock, Perthshire sold a trio of top priced bulls, the highest priced of which was a yellow ticket winner who secured a bid of 5,200gns from A Mccornick and Co, Lochfoot, Dumfries. The October-2015 born Balthayock Lorenzo is sired by the easy calving champion of the Perth and Braco shows and is out of the 10,000gns Balmyle Churchill daughter Balthayock Favourite whose previous son sold for 8,000gns. The Walters went on to sell two of their younger lots – aged 15 months – for 4,000gns a piece, both sired by the 20,000gns Royal Welsh supreme and Highland beef breeder continental champion Maerdy Grenadier. Balthayock Marius was purchased by J and A Cooper and Sons, Laurencekirk, Kincardineshire and Balthayock Mark went on to Kirkcolm, Stranraer with RJ Manson and Partners. Earlier in the day H Adamson and Son, Newport On Tay, Fife purchased the 19-month old Mortimers Highlandfling son Westcarse Lightening from exhibitor’s J H Christie and Son, Stirling, Stirlingshire for 4,800gns. 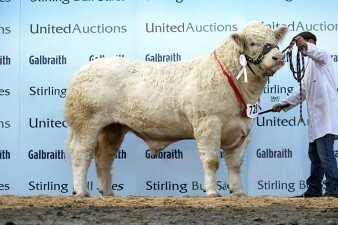 At 4,500gns Mr and Mrs John Wight, Biggar, Lanarkshire were the next to sell. 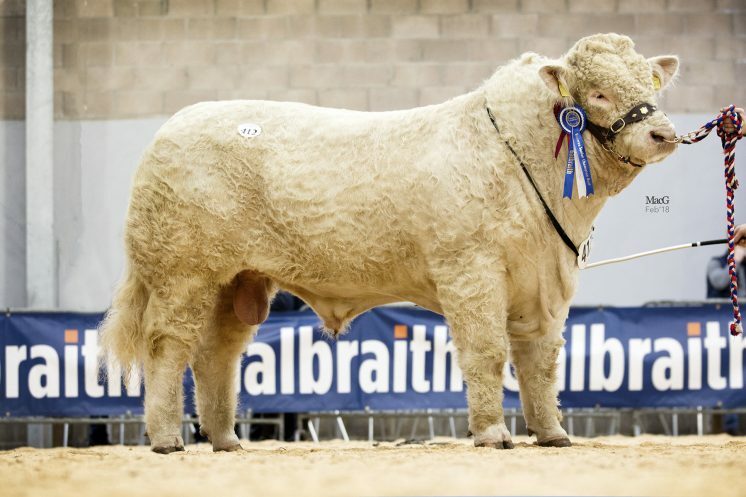 The August-2015 born Midlock Luck who had placed second in his class the previous day and is sired the 17,000gns Elrick Highlander was snapped up by Aitken Bros, Linlithgow, West Lothian. The final lot to bring 4,000gns was the 20-month old Baillieston Luke, a son of the 25,000gns Stirling supreme champion Maerdy Hasse from Ronnie Baillie and Co, Deerness, Orkney. Balmirmer Farms were the successful bidders and take him home to work at West Balmirmer, Angus.